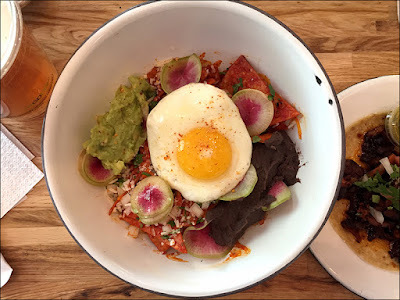 Foie Gras Hot Dog . 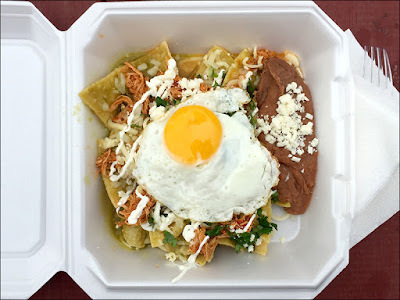 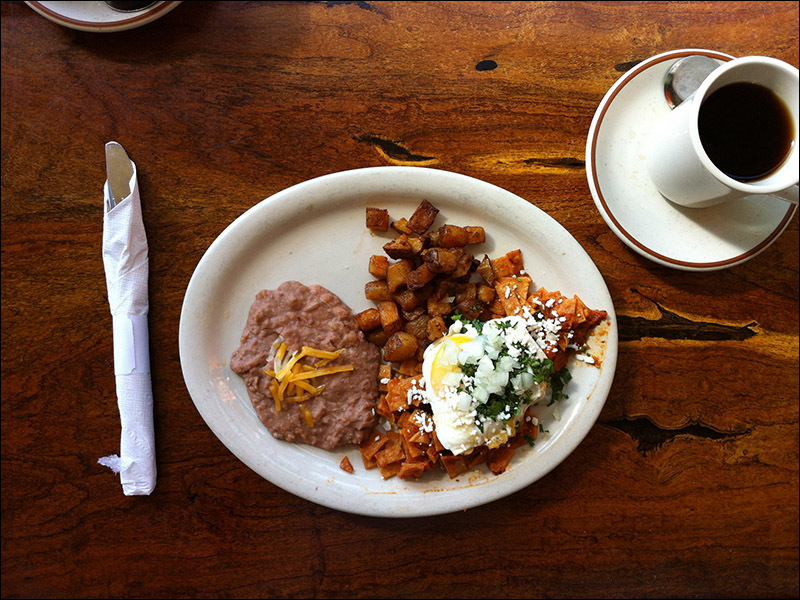 Austin, TX: The New State of Chilaquiles in Austin, Texas (or, what a long, strange trip it's been). 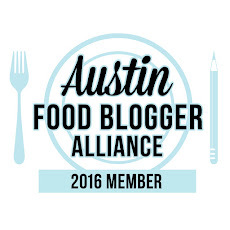 (or, what a long, strange trip it's been). 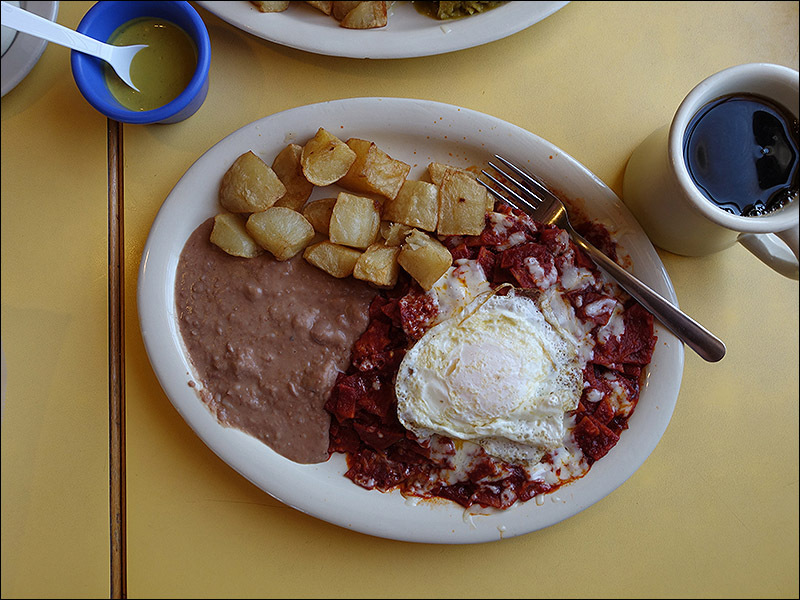 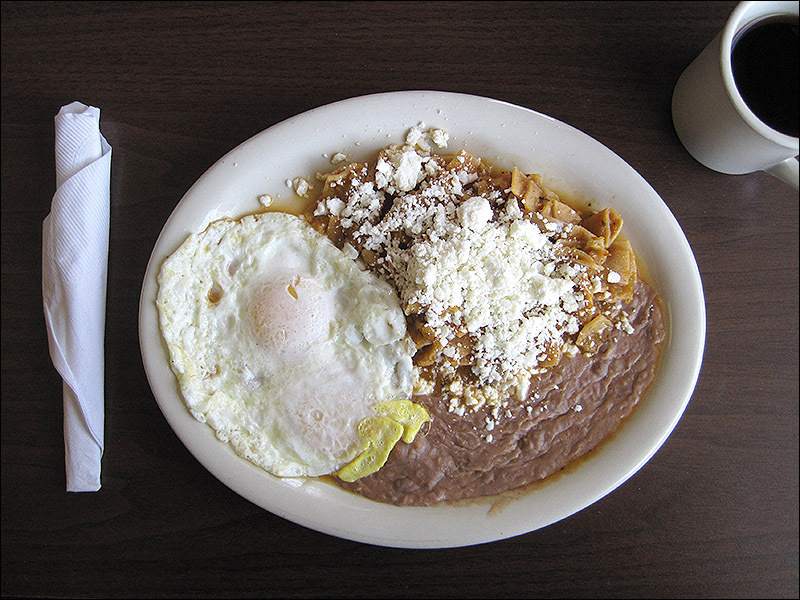 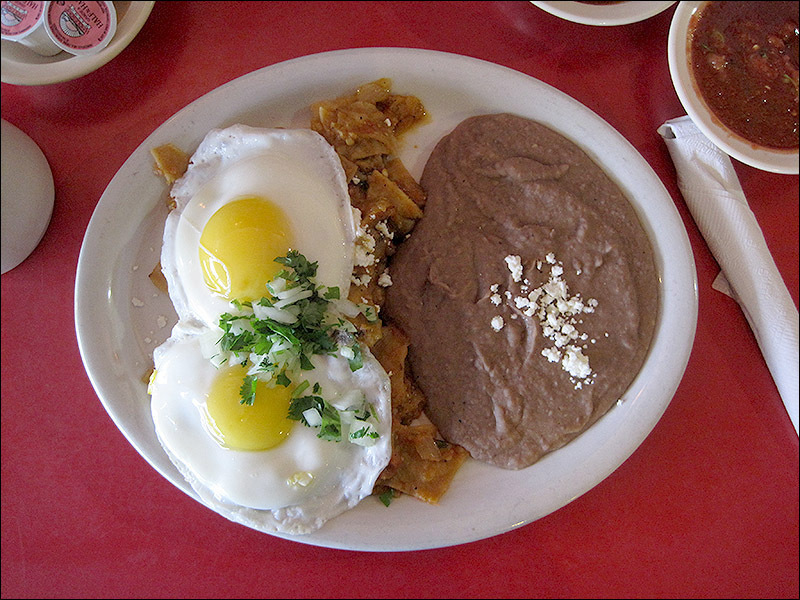 We've been scouring Austin for the very best chilaquiles it has to offer. 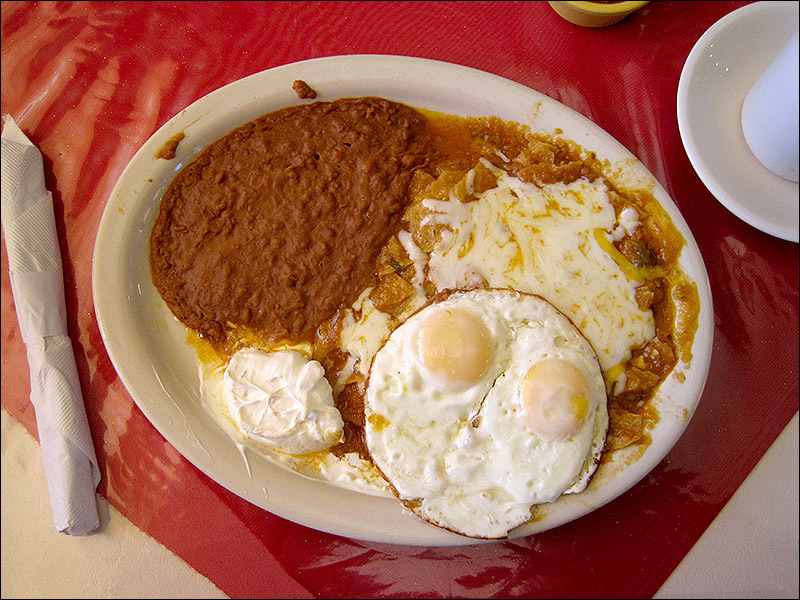 We've torn apart the town, top to bottom, for five years sampling both highbrow and humble versions of this traditional Mexican dish. 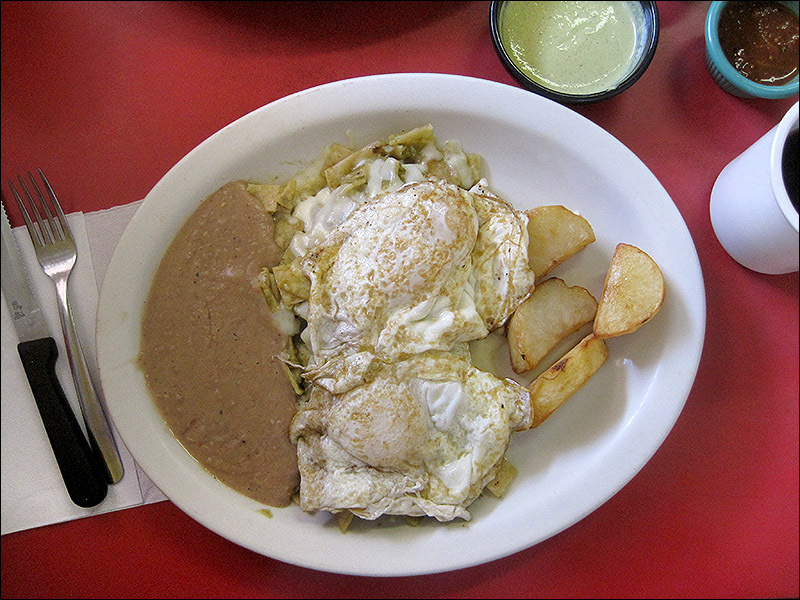 If a restaurant presented only one sauce option for chilaquiles, Julie and I would typically order the same dish. 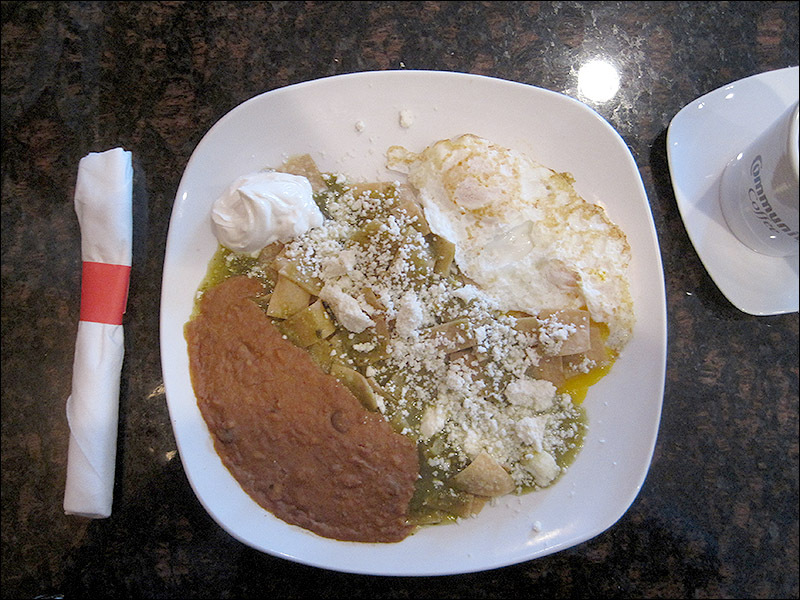 If a restaurant had both verdes (green) and rojos (red), we'd order one of each. 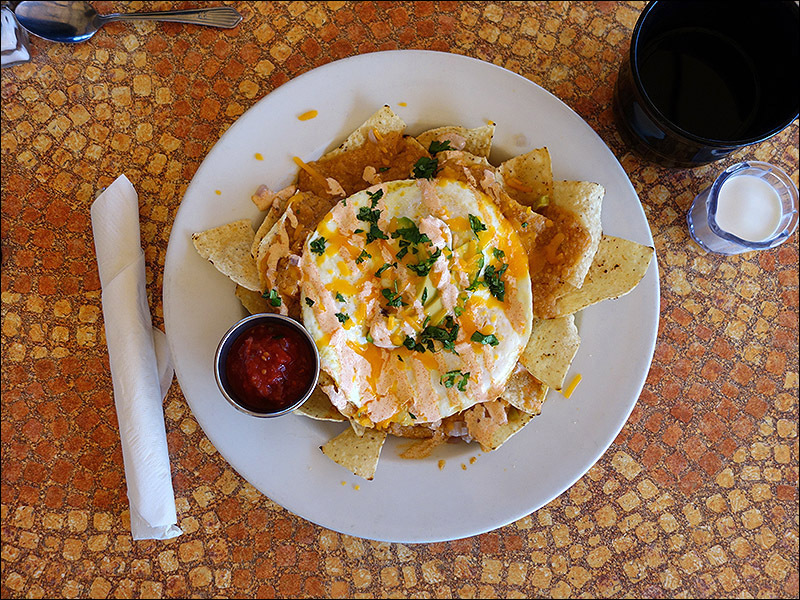 The majority of the time, we'd order eggs over-easy. 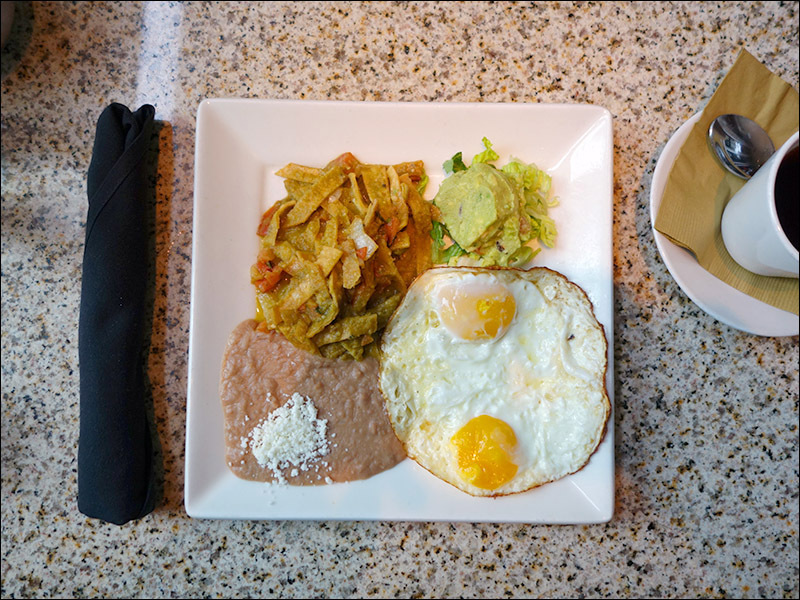 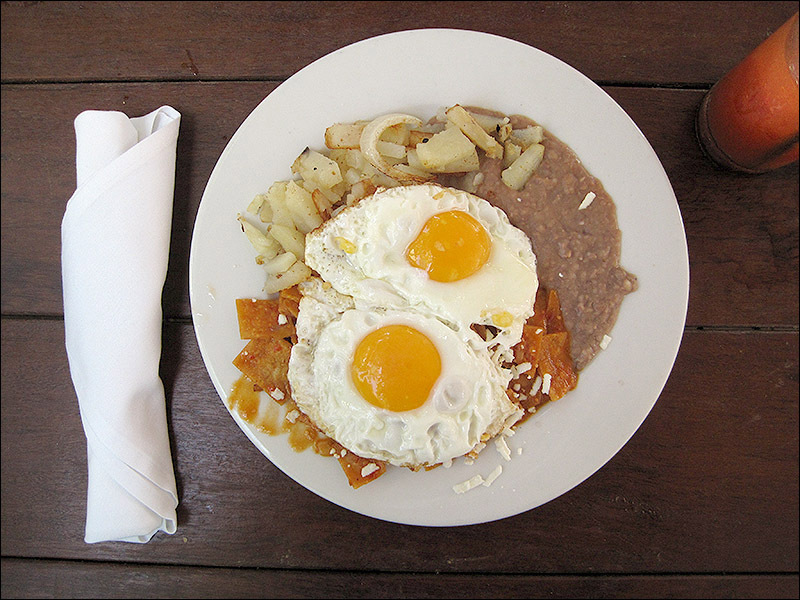 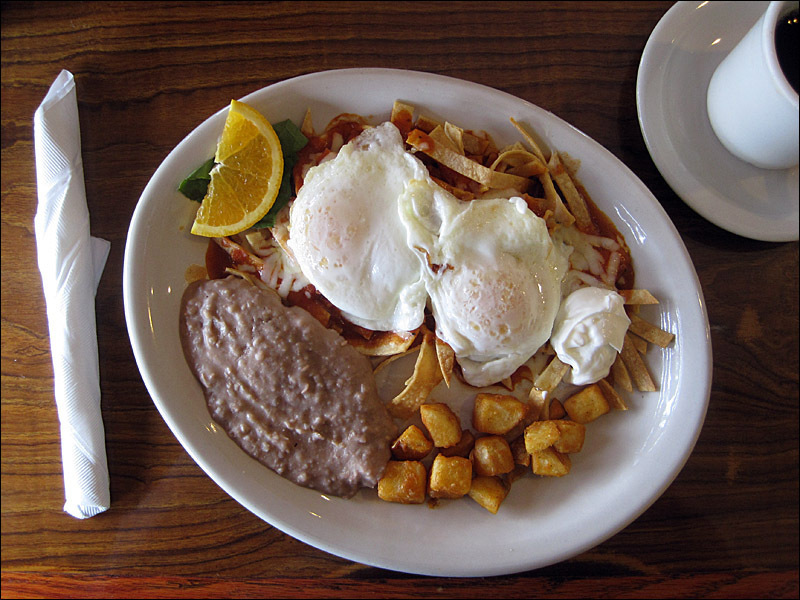 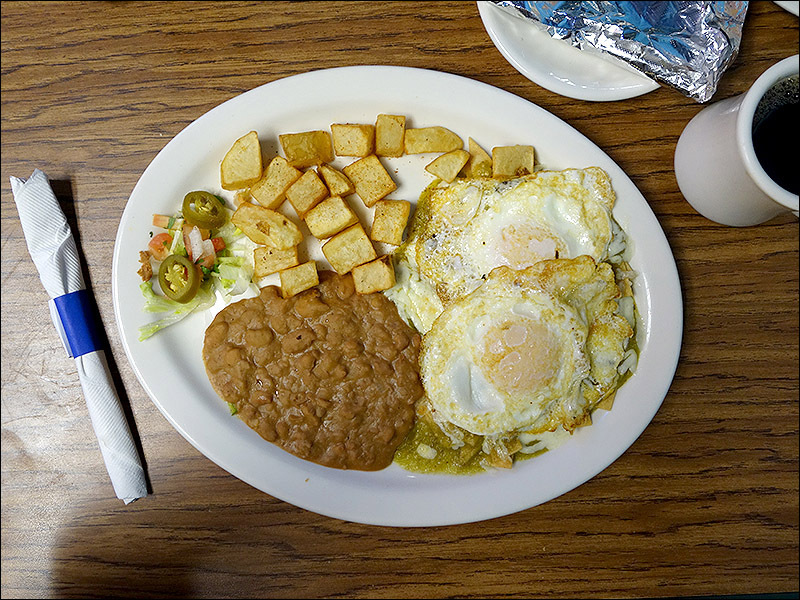 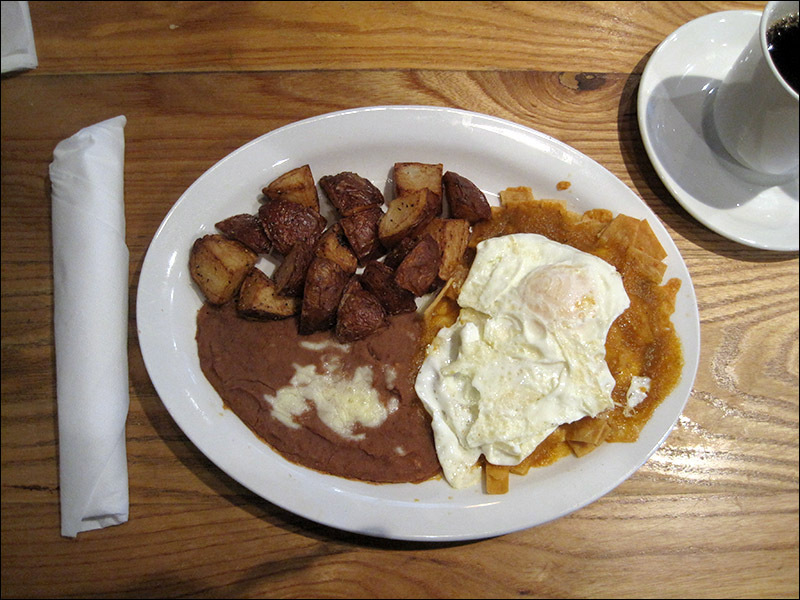 If we knew the eggs were going to be happy eggs (see $10 chilaquiles), I'd go for sunny-side-up. 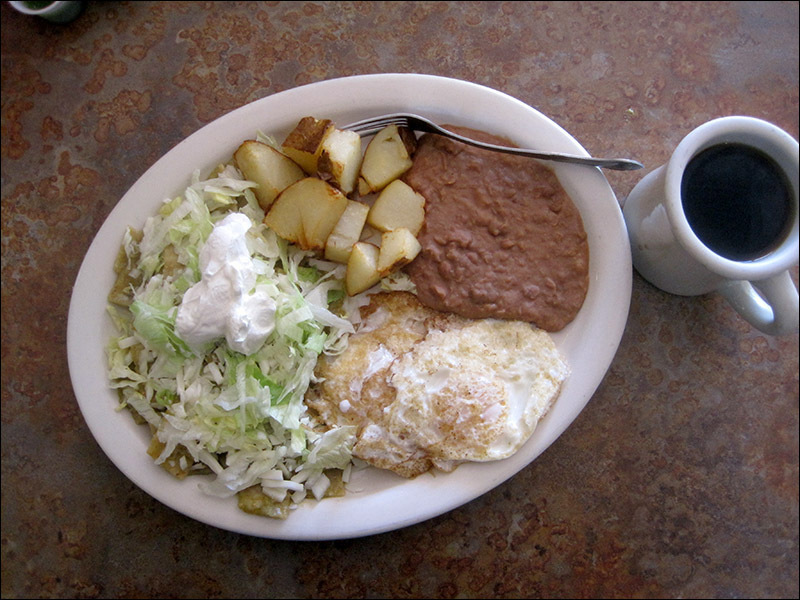 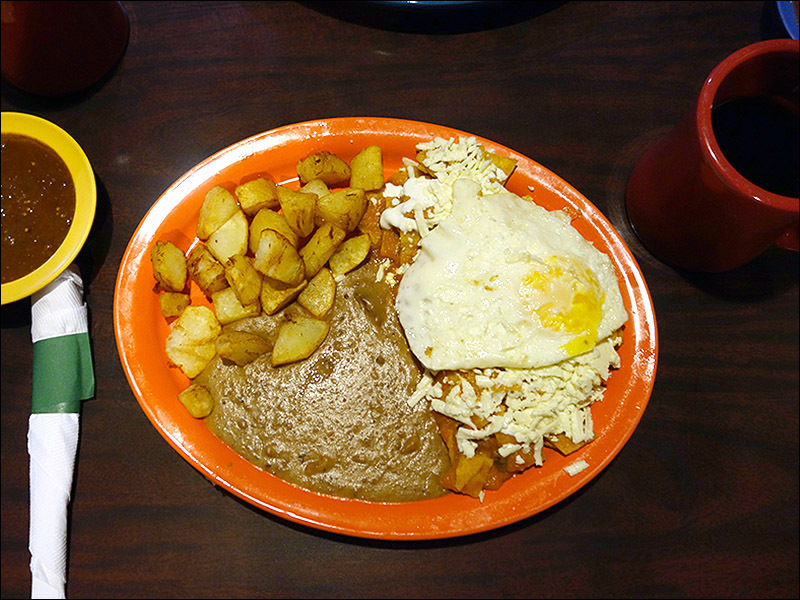 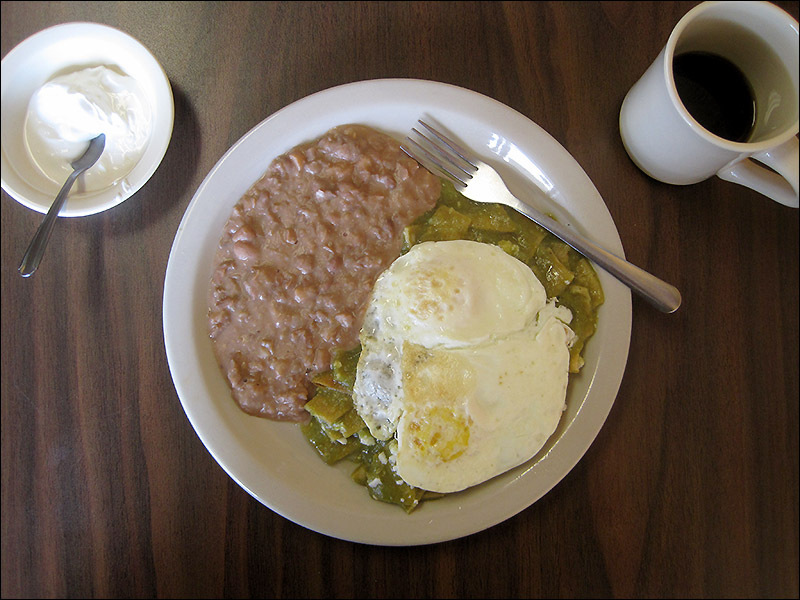 Beans, potatoes and accoutrements (if available) were taken into consideration, as was the coffee or aguas frescas. 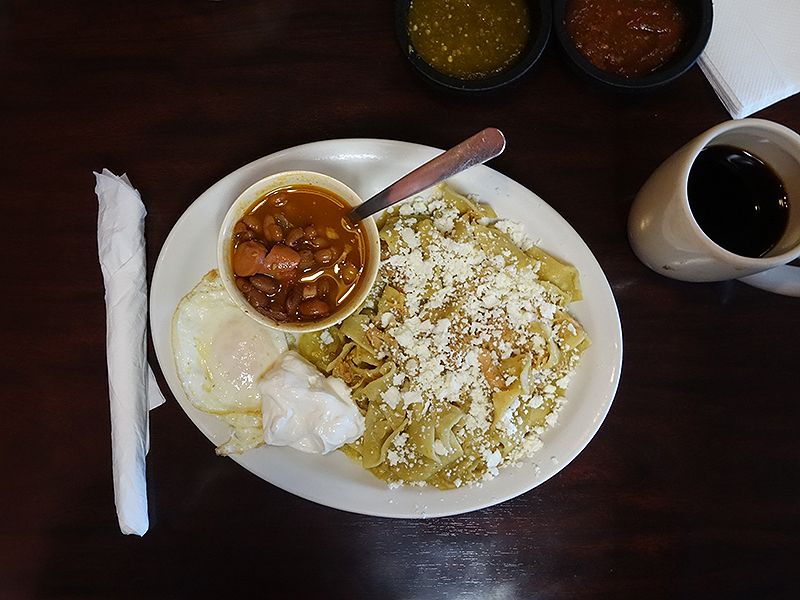 The overall experience was key, but really, it all came down to the chilaquiles. 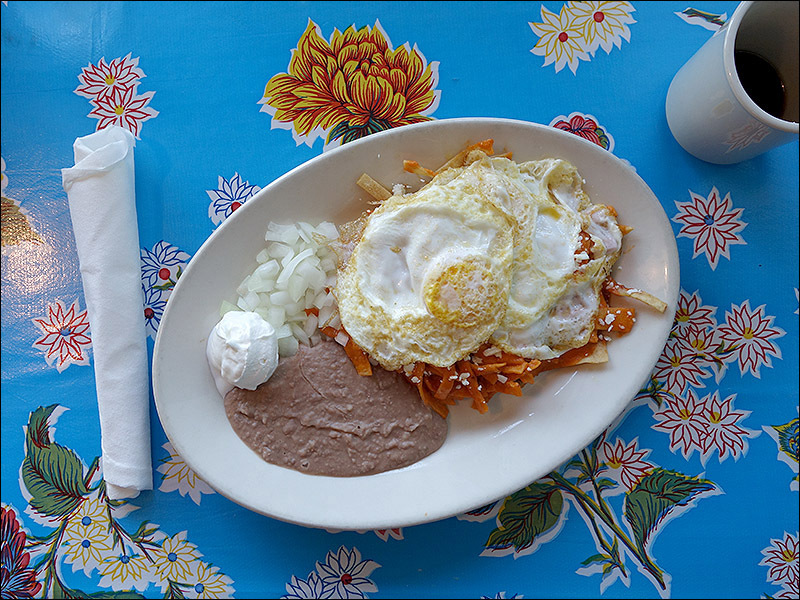 After eating 120 different plates of chilaquiles, we've done our due diligence, and now, we humbly present to you establishments that Julie and I both agreed have the finest chilaquiles in Austin. 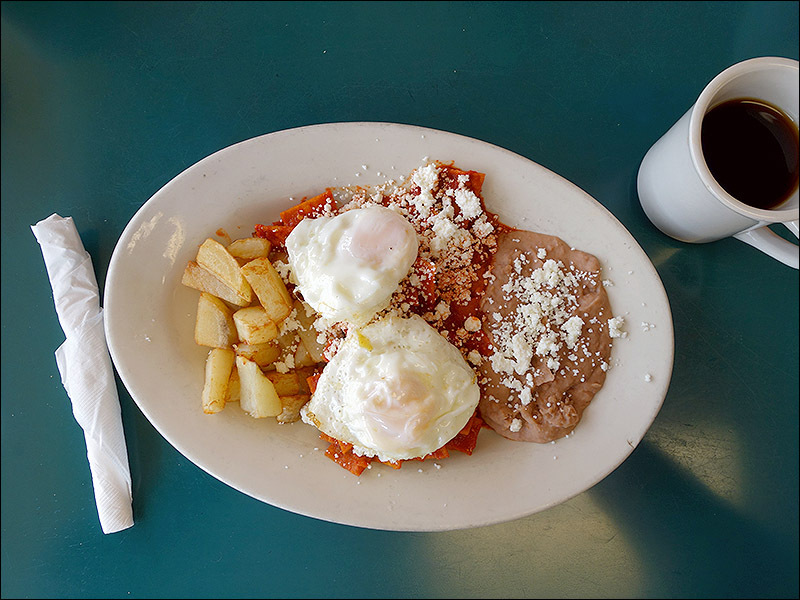 These are our favorites, the places we return to time and time again. 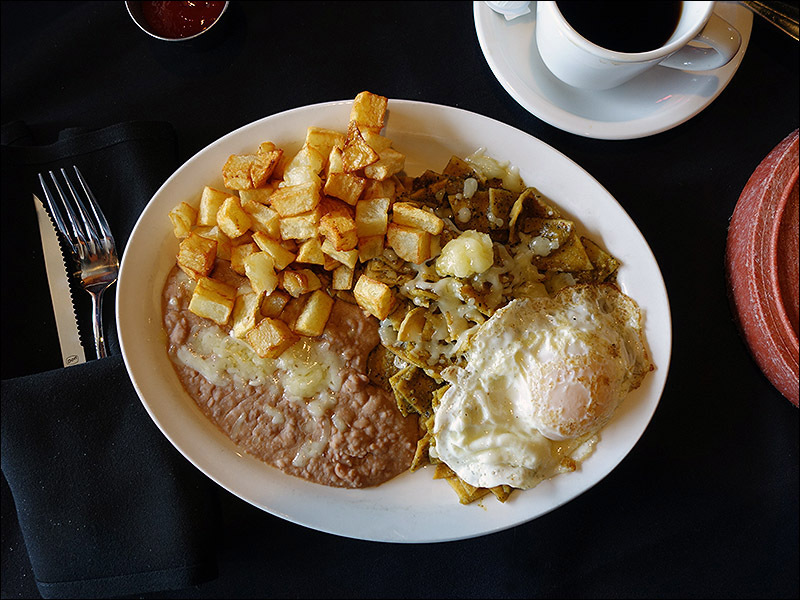 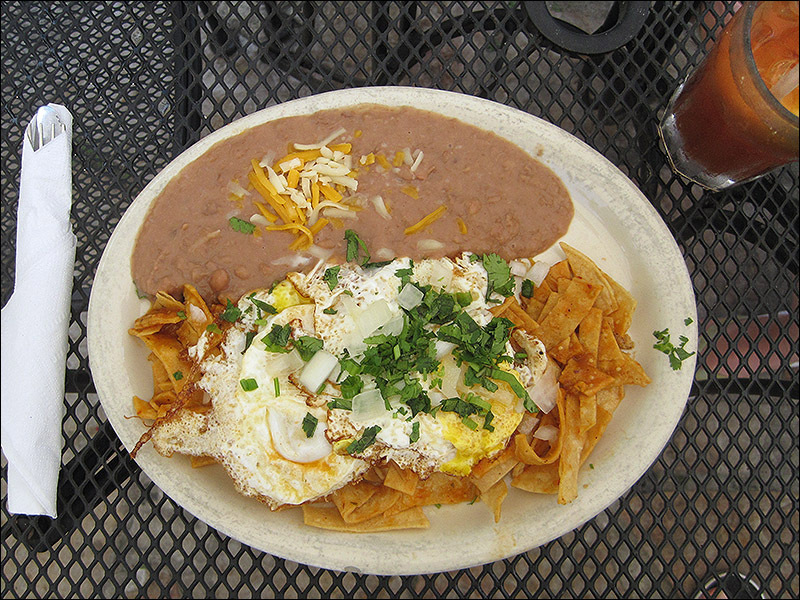 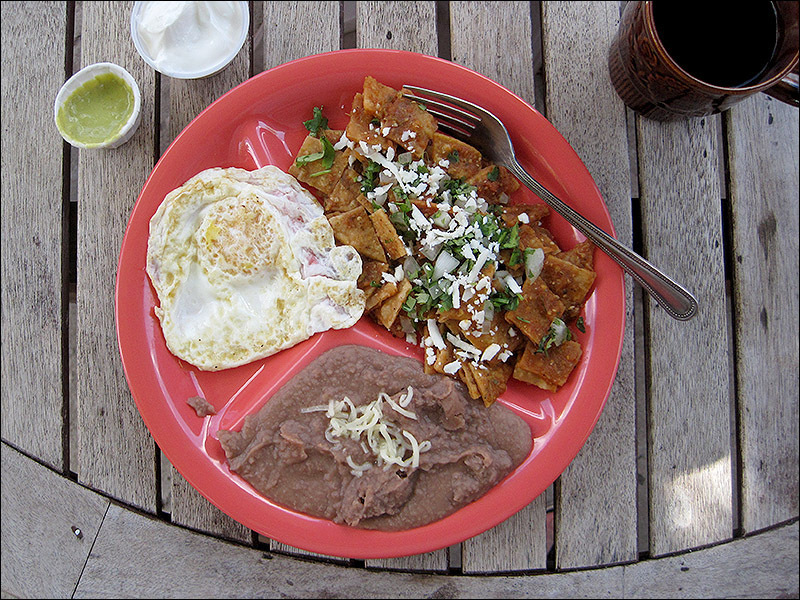 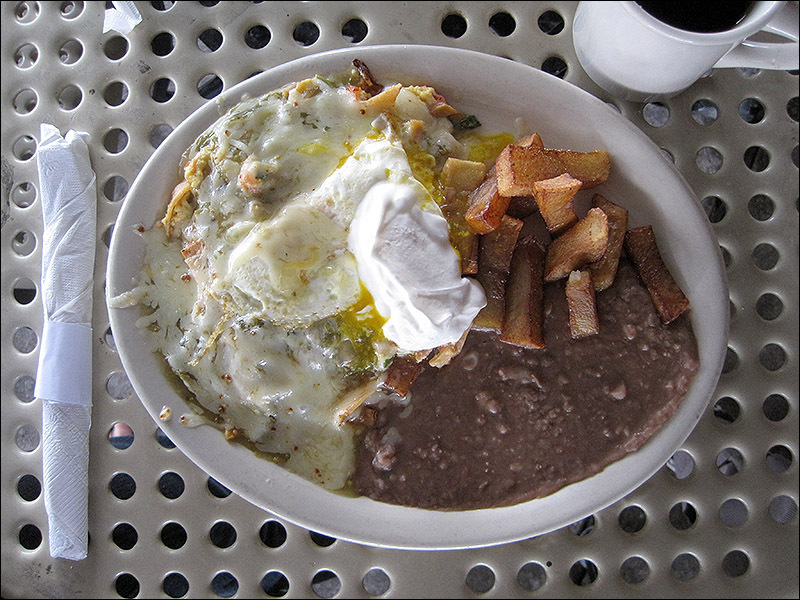 If you wanted to be technical, these chilaquiles are not in Austin. 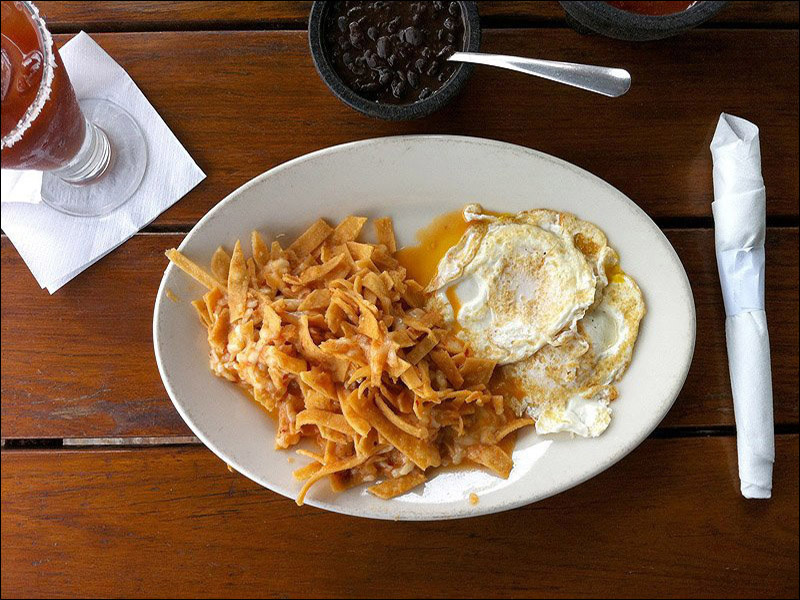 If you wanted to be technical, you'd miss out on a really perfect serving of chilaquiles. When we heard there was going to be a food truck in Austin that just served chilaquiles, we were more than a little excited. 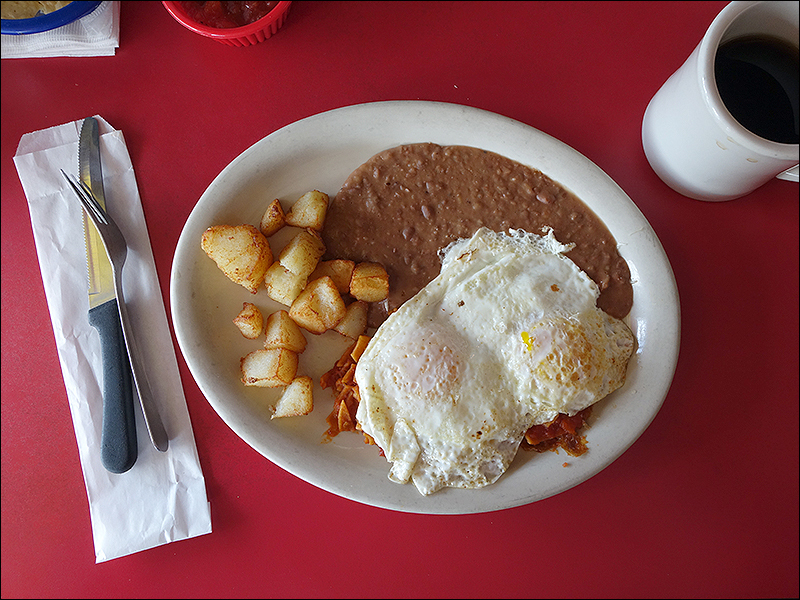 We were fainting-couch excited. 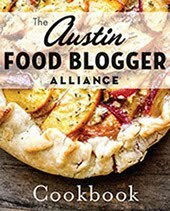 Is that a thing? 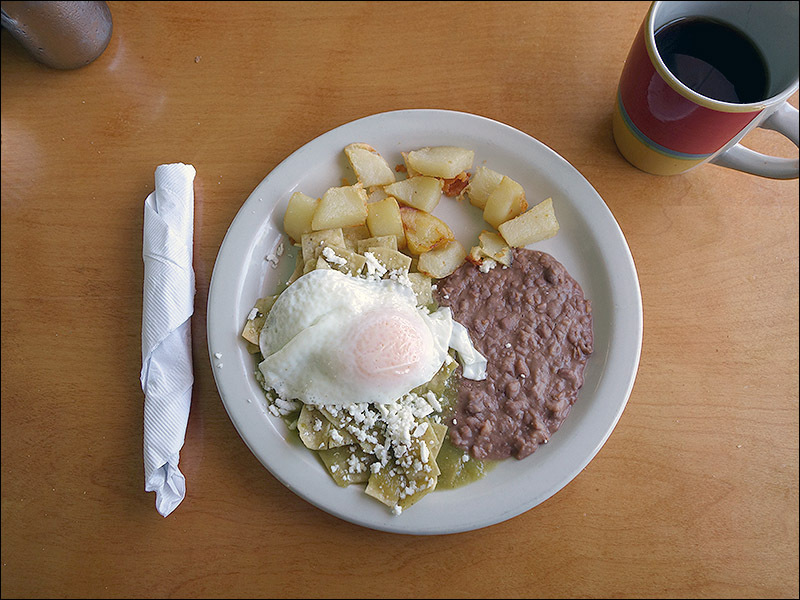 I called the phone number to see where they were located, and we set off to the (now closed) South Austin Trailer Park and Eatery in the Bouldin Creek area. 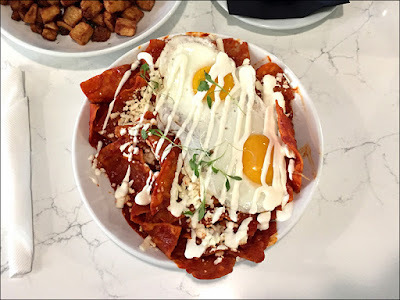 The menu was a little different than expected, with all of the chilaquiles options served as bowls, rather than breakfast plates, but it all looked really delicious. 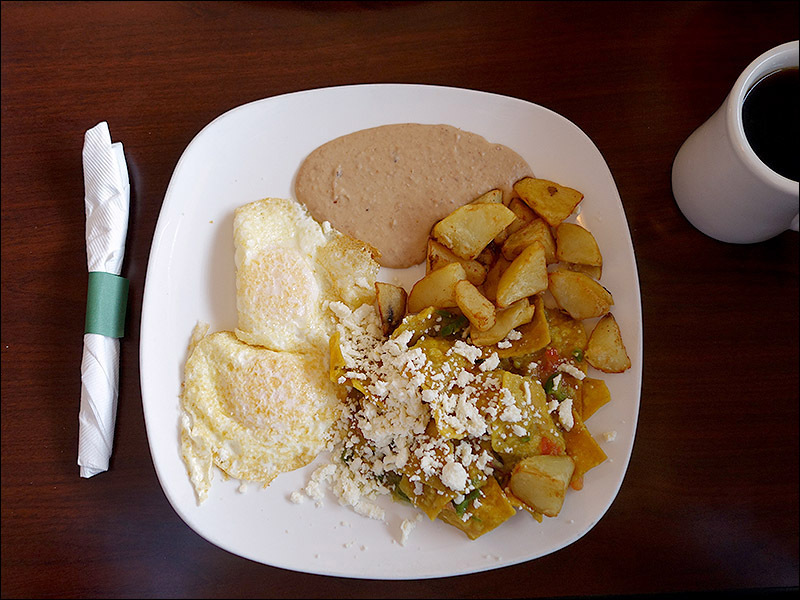 We tried the traditional bowl – one with a rich red salsa and one with a jaunty green salsa – crema, queso panela, red onions, avocado and a lonely sprig of cilantro. 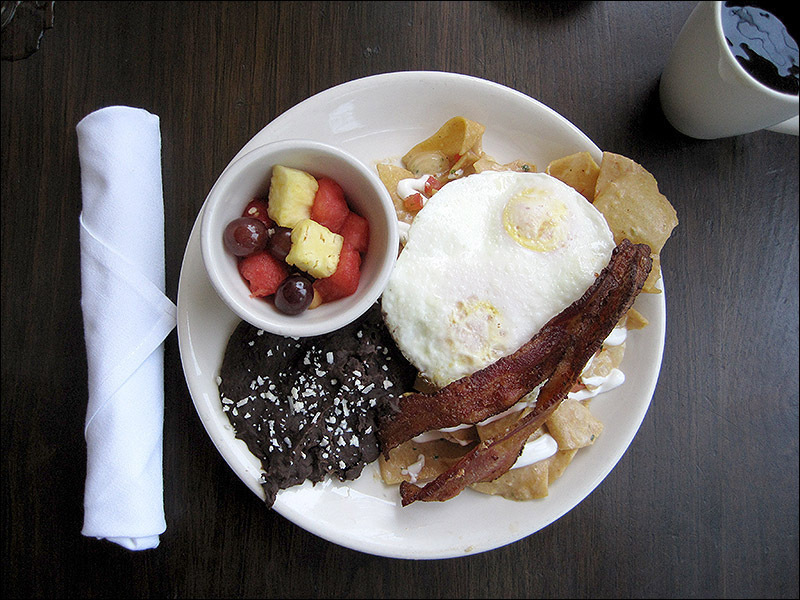 We asked for a sunny-side-up egg on each, and the gentleman taking our order seemed a little flummoxed. 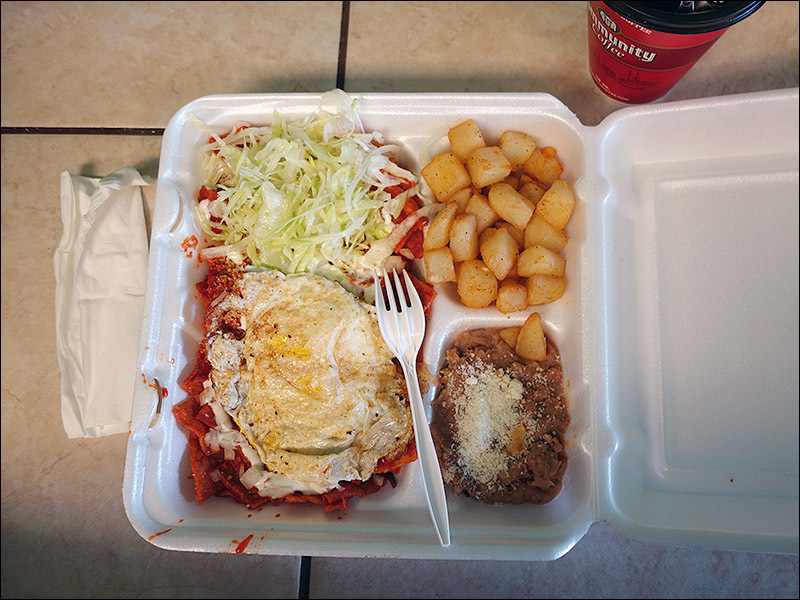 Turns out they had no huevos, but without even mentioning it, he ran over to the convenience store across the street and we saw him bring back a dozen. Dai Due has made itself a household name in Austin based on exceptional execution with hyper-local ingredients. 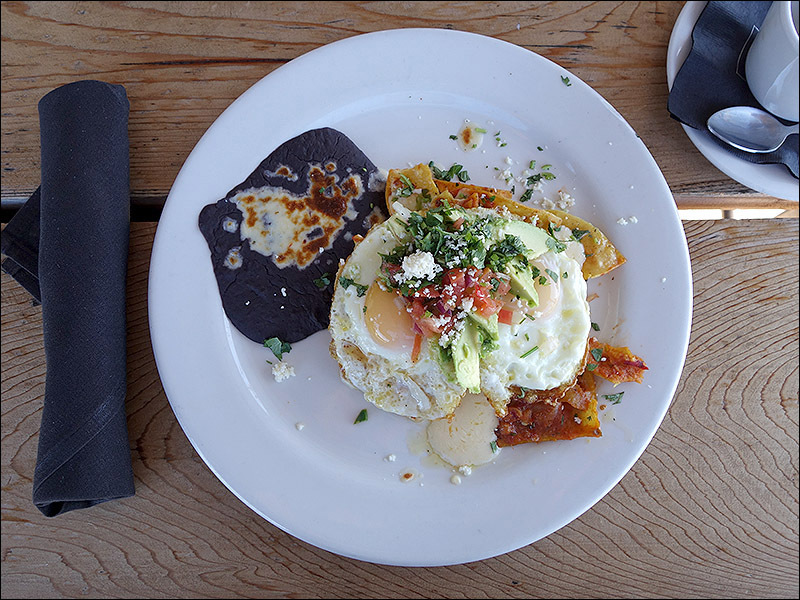 Whether it's their butchery and balanced blessing of local meats (including invasive feral hogs and wild deer) or the sourcing and sensitive study with local produce and fruits, everything on their menu is thoughtful, thorough and truly beautiful. 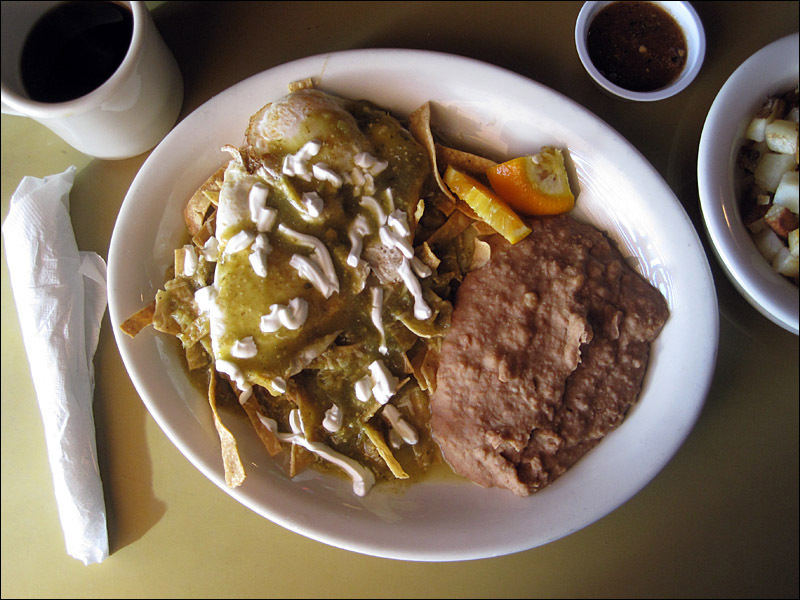 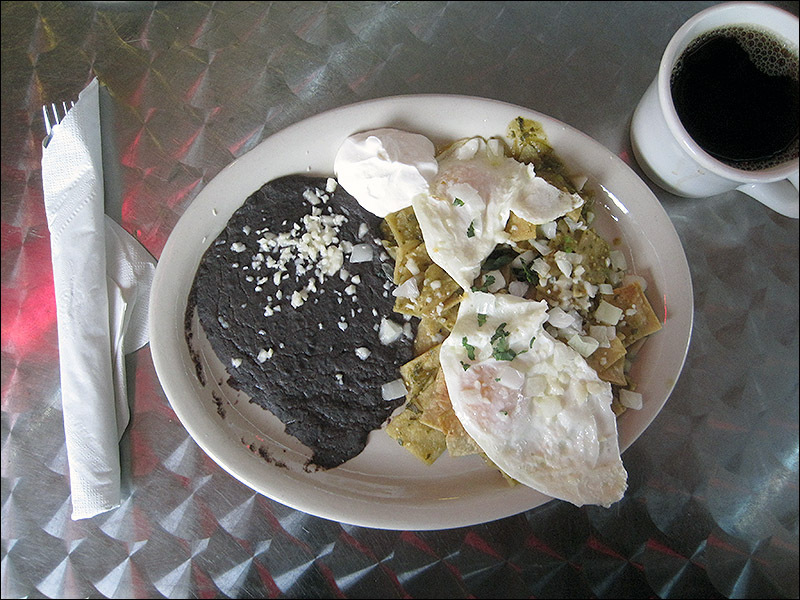 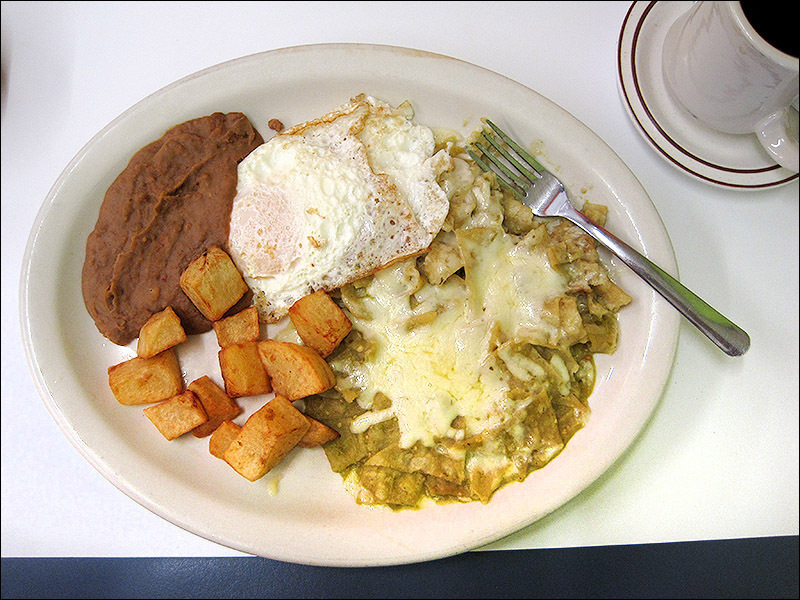 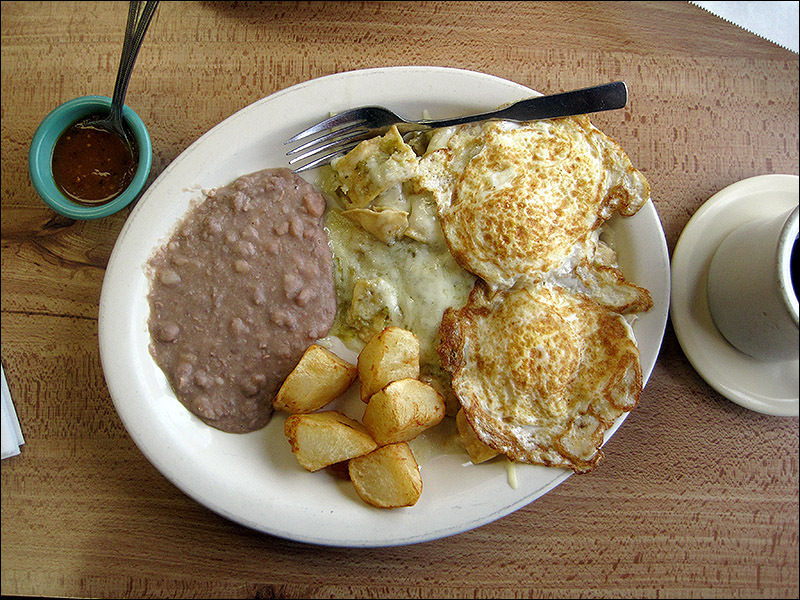 Anna Salinas' chilaquiles verdes, served with pinto beans, are right at the top of my list of favorites in Austin. 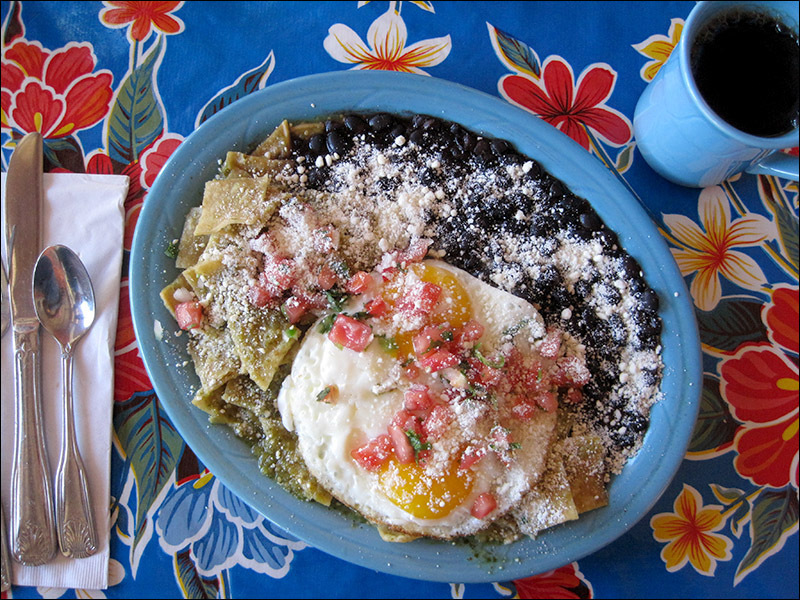 In Italian, the perfect doneness of pasta is "al dente." 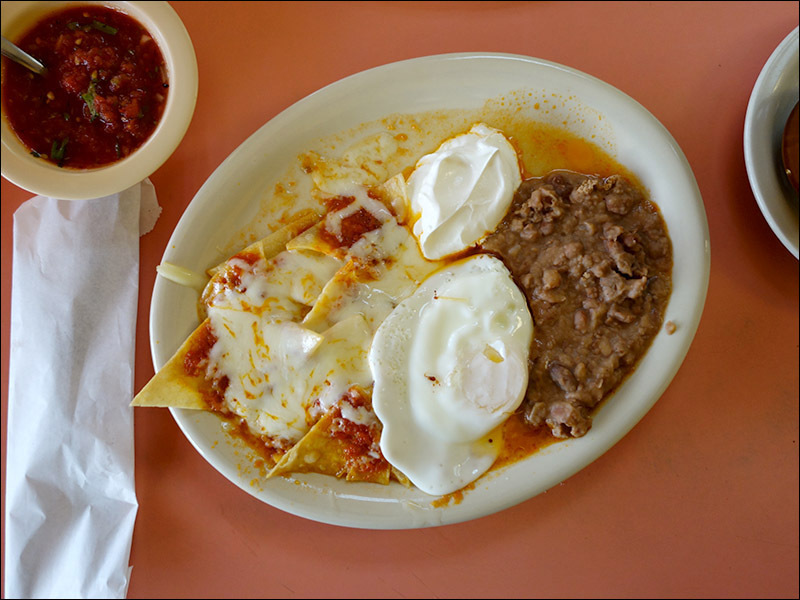 I don't know if there's a word in Spanish for totopos quickly and gently simmered in sauce until they are at the knife-edge-thin line between completely-crispy and slightly-sodden, but there should be. 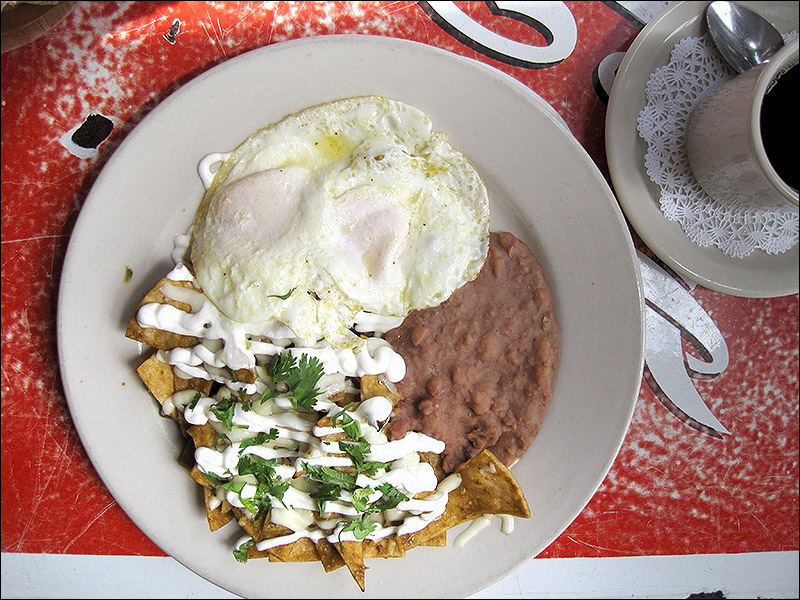 They need to have just the right tooth. 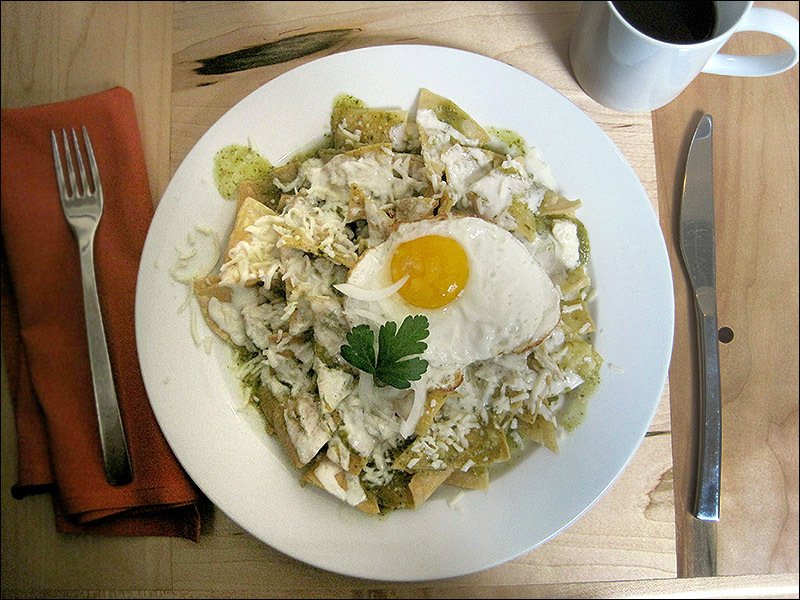 The homemade totopos in El Torito's chilaquiles dance on that razor's edge, every time we visit, and the verdes version is supremely fresh, bright and tangy. 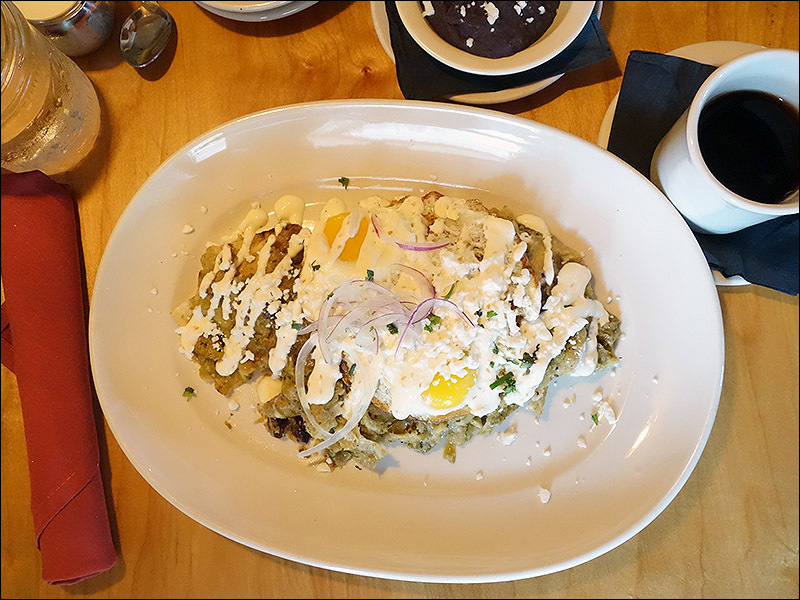 Online brunch menu touts The Goodnight's chilaquiles as "Crispy corn tortillas, creamy tomatillo sauce, sour cream, pico de gallo, two eggs." 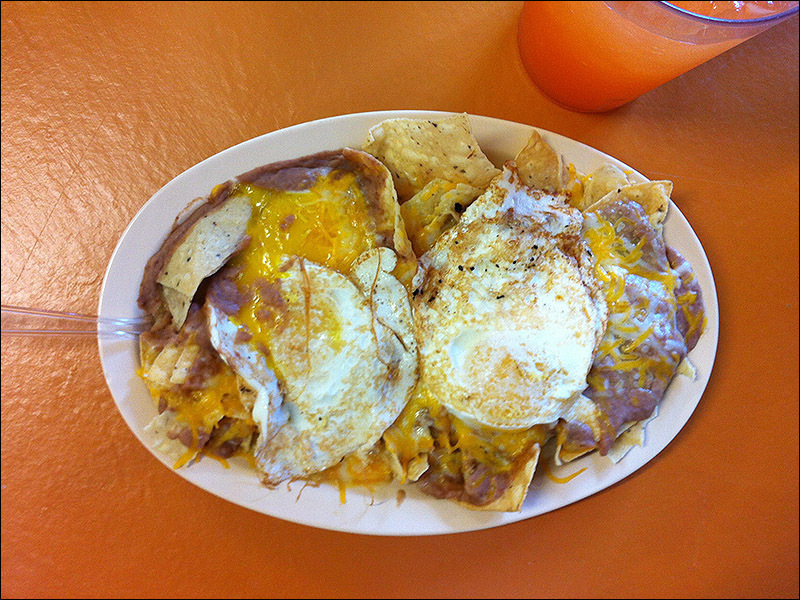 Twelve bucks. 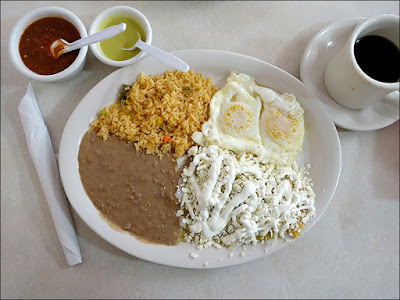 Sure, we'll bite. 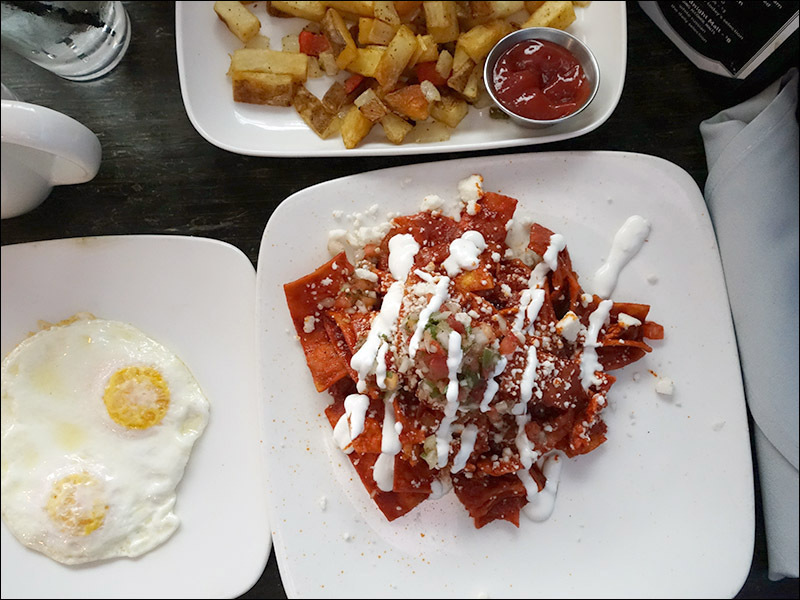 The actual menu, in restaurant, describes The Goodnight's chilaquiles as "Crispy corn tortillas with chicken, guajillo sauce, sour cream, scrambled eggs, black bean and corn pico de gallo." 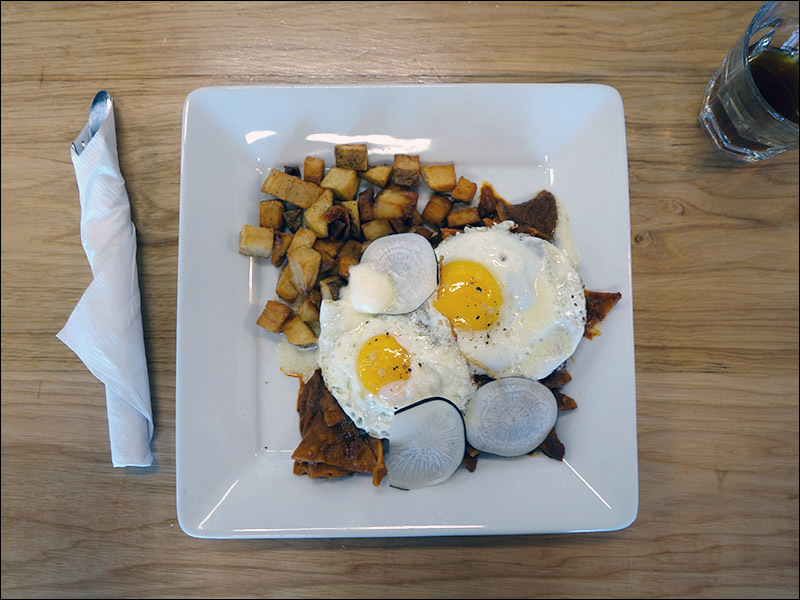 We asked for our eggs over-easy, Julie's plate sin carne, and got a very pretty stack of nicely-crisp chips with a rich, mean-looking guajillo sauce. 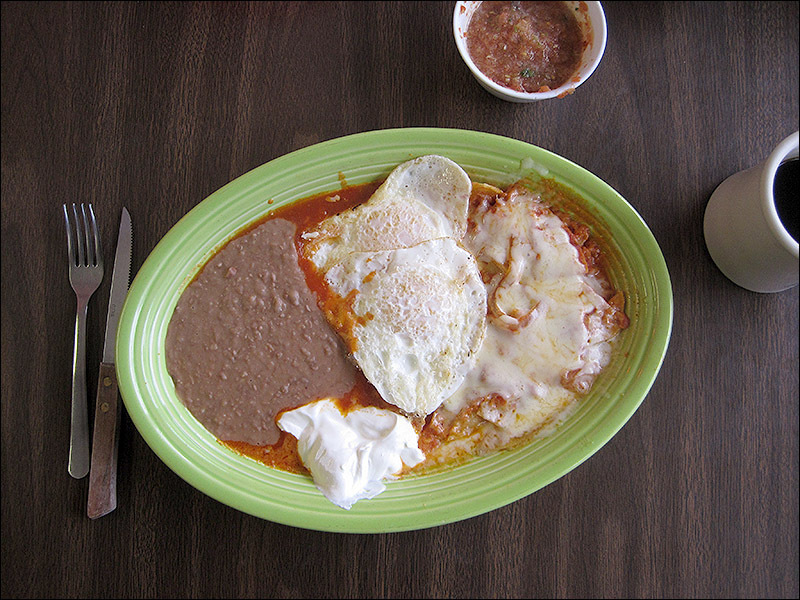 But the flavor was lacking, with no heat or bite to the salsa. 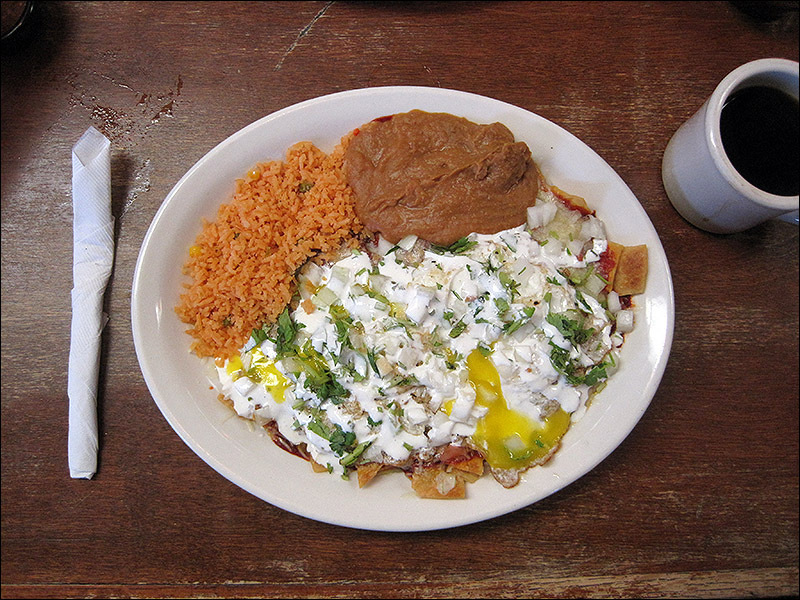 The black bean and corn pico was just straight teeny-tiny minced pico, the eggs were on the side, and everything around the outside of the plate was cold. 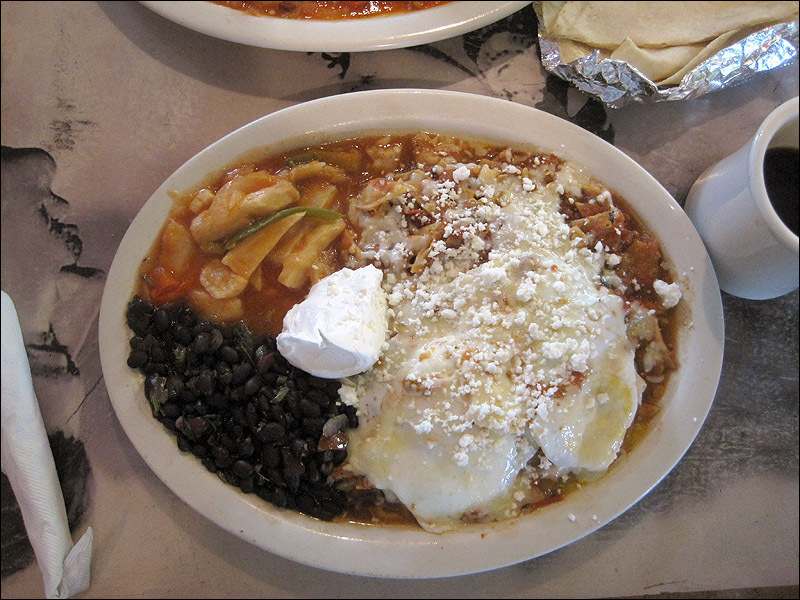 The only hot spot was in the middle of the stack, and that was only on my dish with chicken. 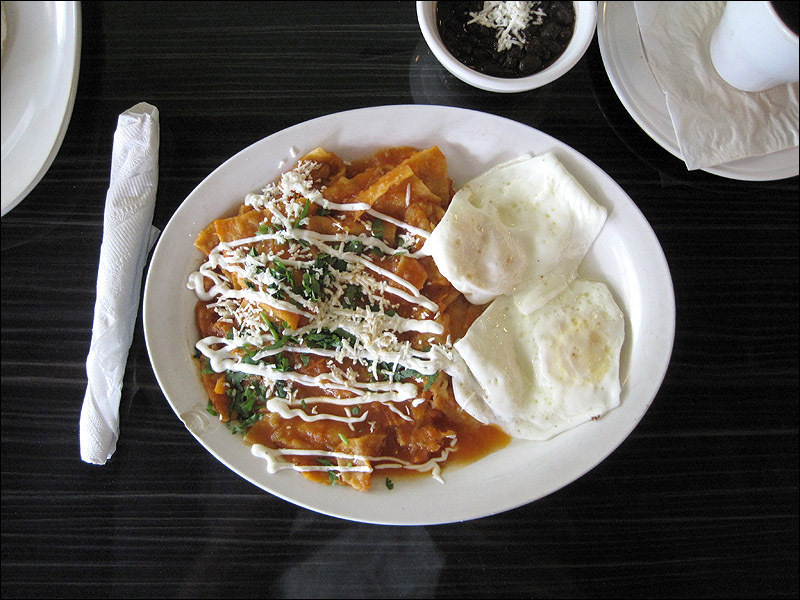 Note: Kerbey Lane's chilaquiles are now on their regular menu. 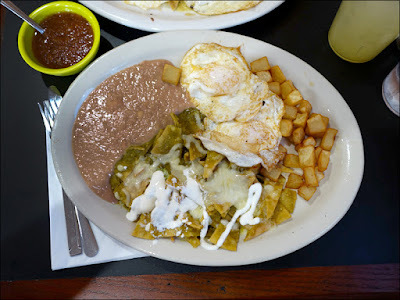 We'd been told several times that Kerbey Lane Cafe served a great plate of chilaquiles, but every (wrong) time we'd visit and ask for them, we were denied. 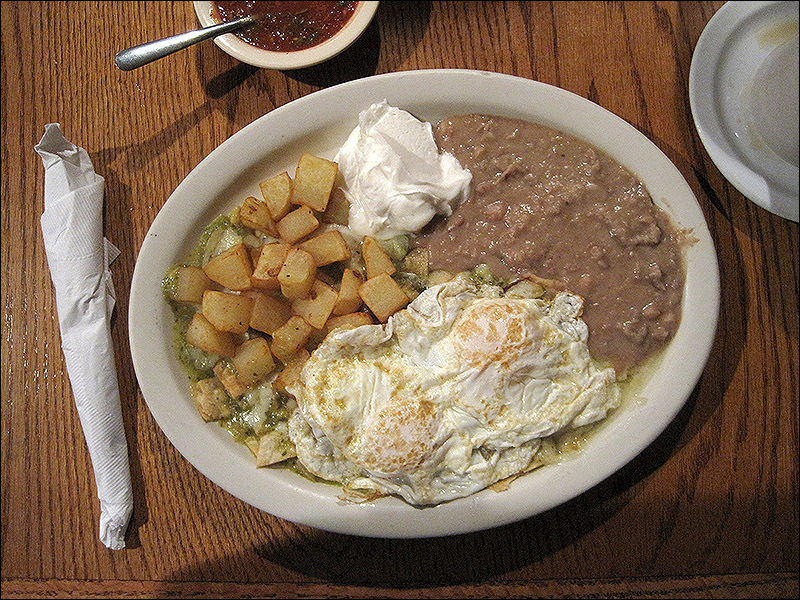 For some reason, they were a seasonal menu item, and we just weren't making it there in the right quarter. 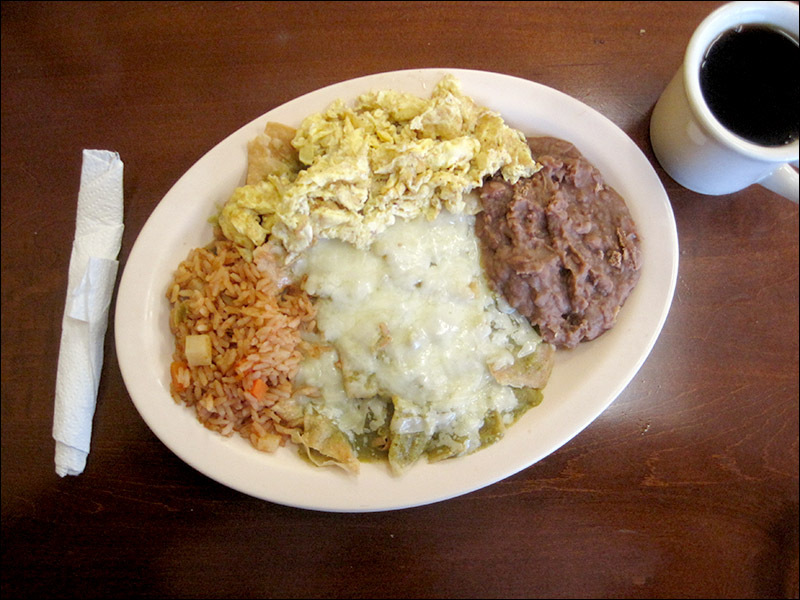 We could, of course, have migas but we do not eat migas. 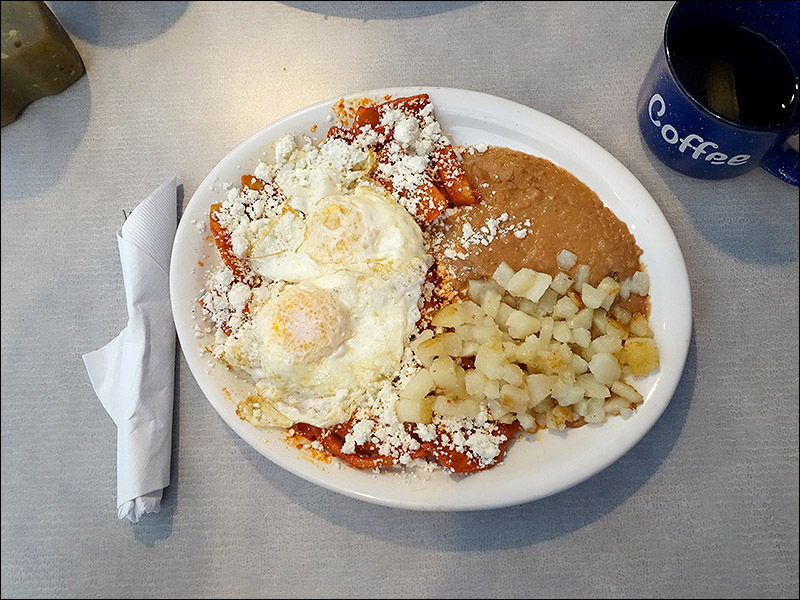 I was wary, as I am of any restaurant whose website says they have an "expresso machine," because Kerbey Lane is known for 24-hour-a-day comfort food, a half-dozen varieties of pancakes, and their cowboy queso, not for authentic Mexican breakfast. 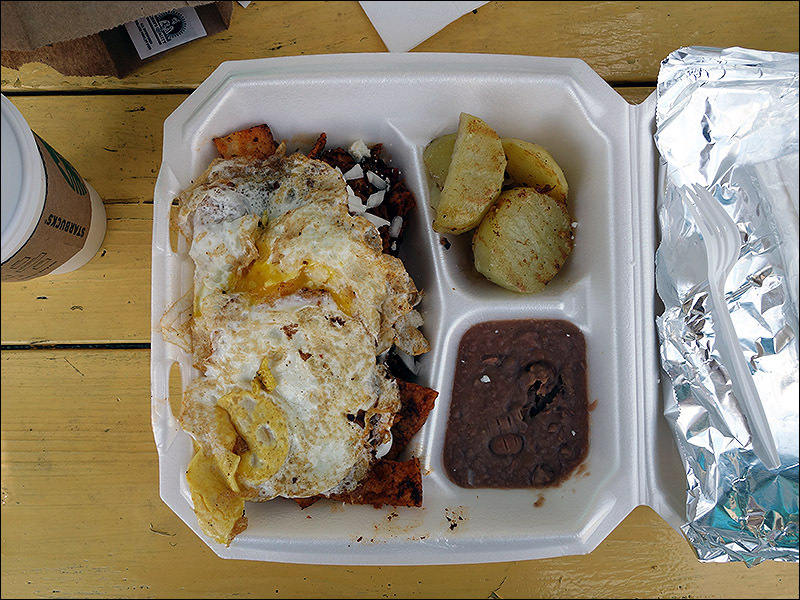 Macho Taco was, unfortunately, a rebound. 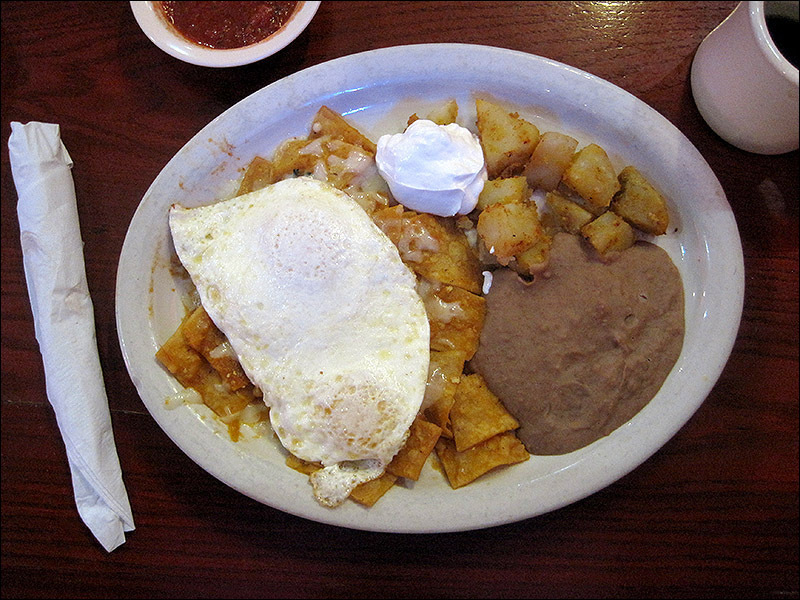 We had originally gone to breakfast at El Torito. 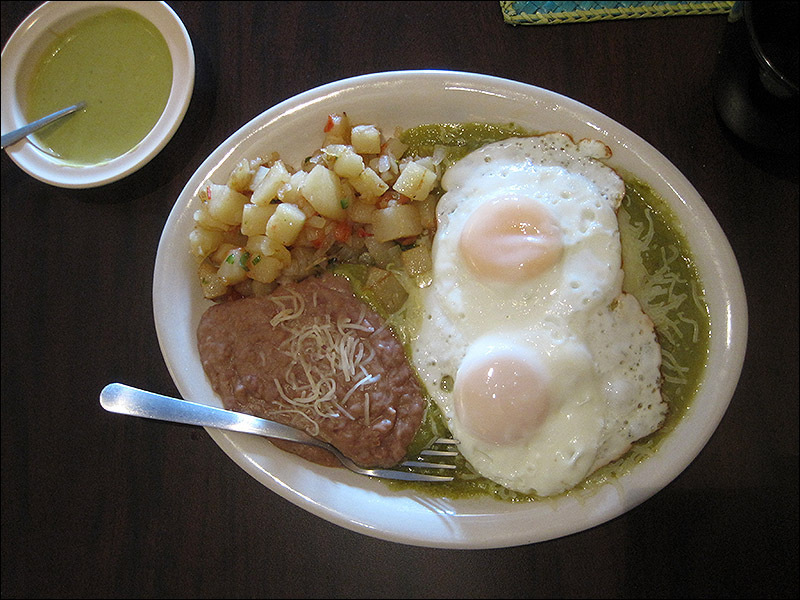 Actually, we'd arrived at El Torito to find it permanently closed, and we were a bit despondent. 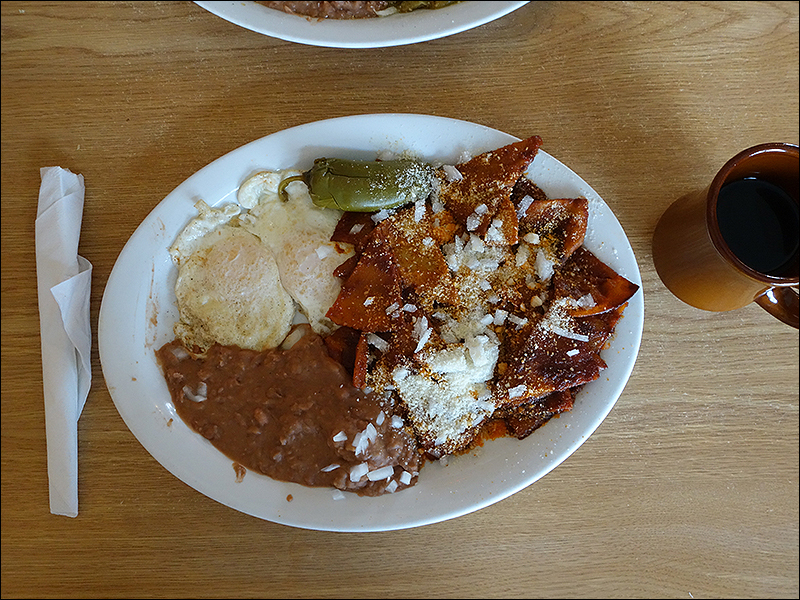 The chilaquiles at Macho Taco were serviceable for the circumstances. 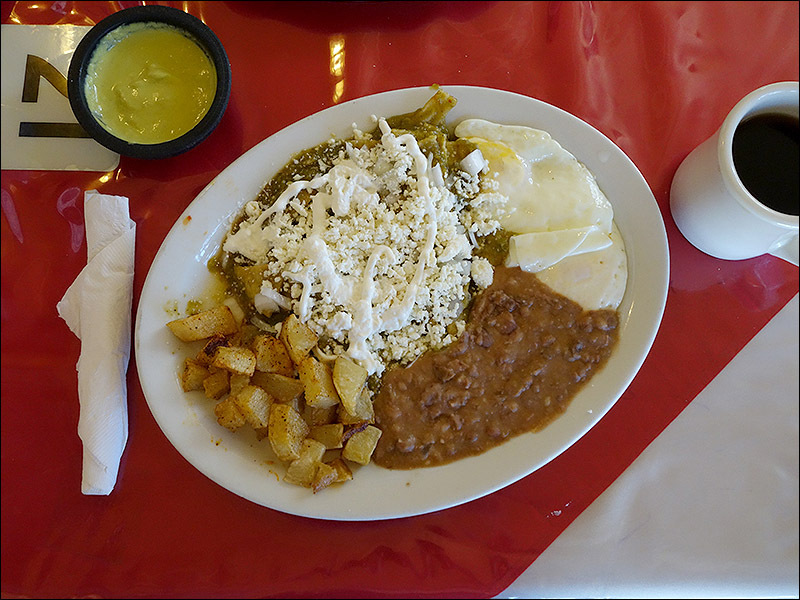 The verdes was creamy but had a nice heat to it and the totopos had a good tooth. 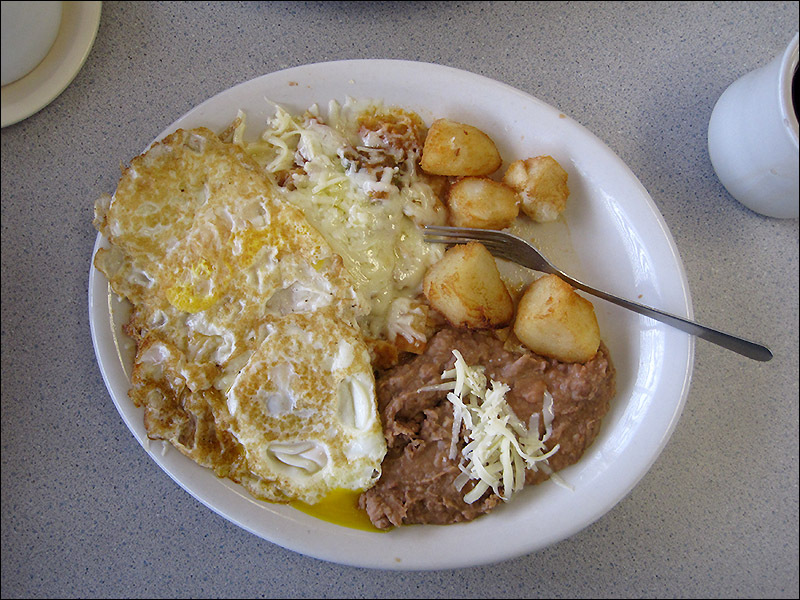 Potatoes and beans were the usual. 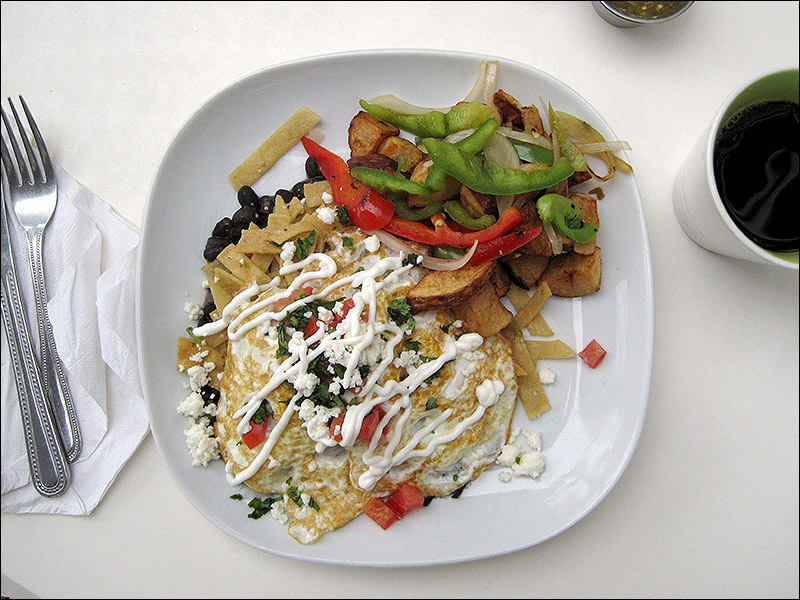 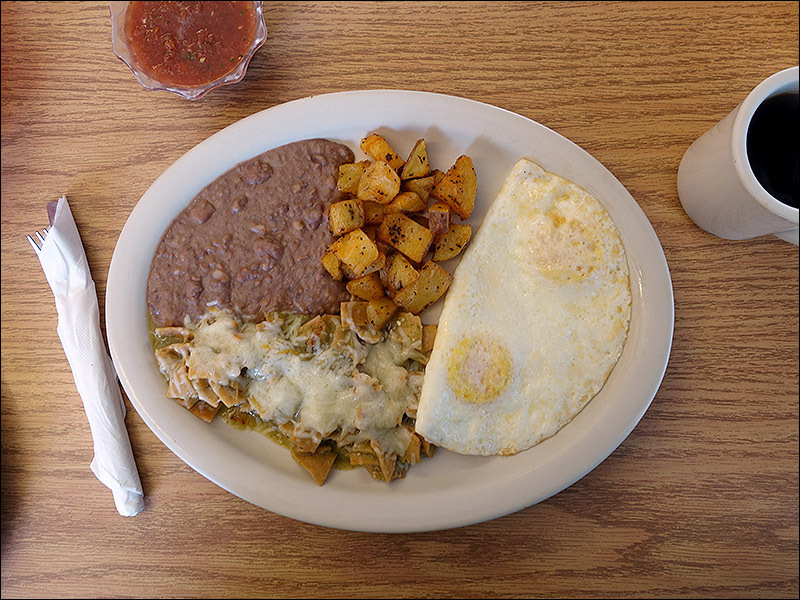 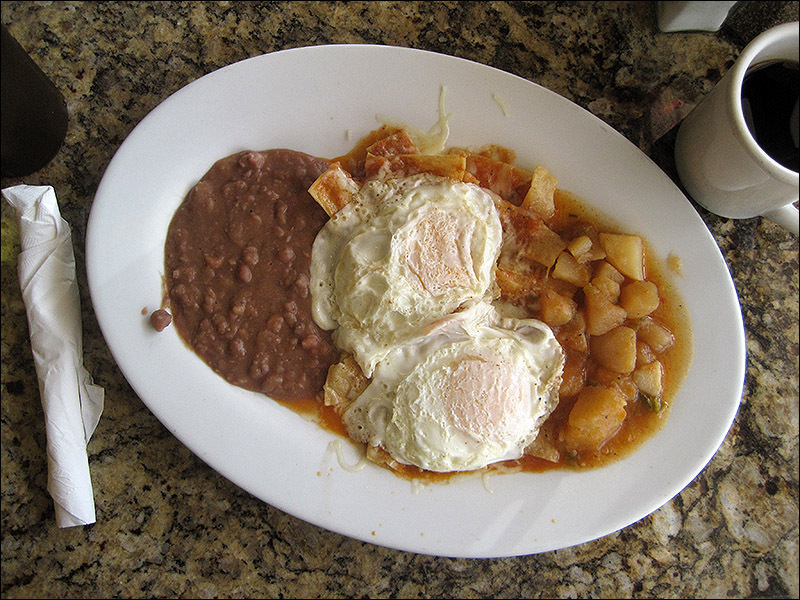 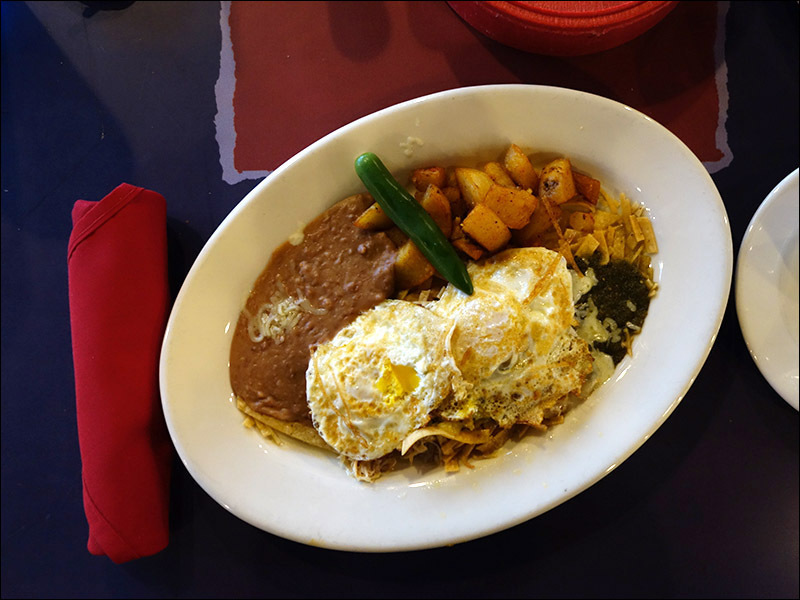 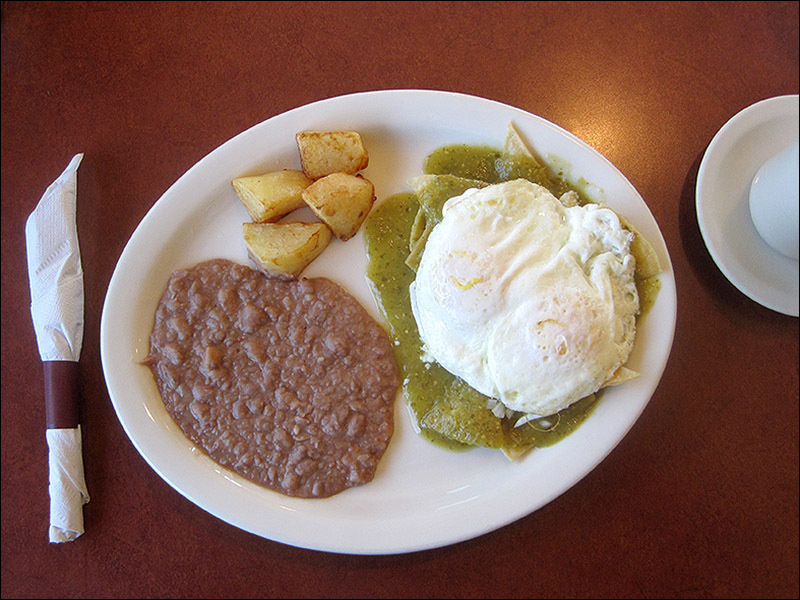 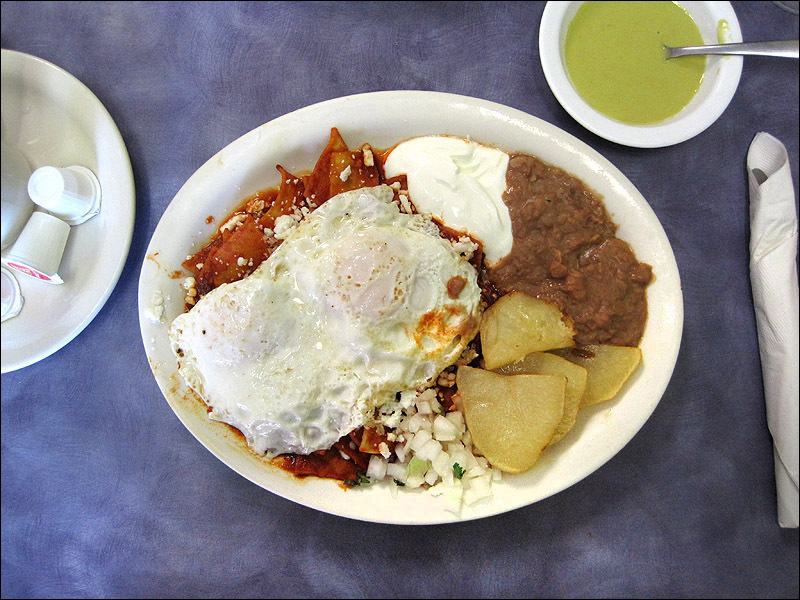 Right across the street from the excellent chilaquiles at Los Pinos is Rosita Kitchen. 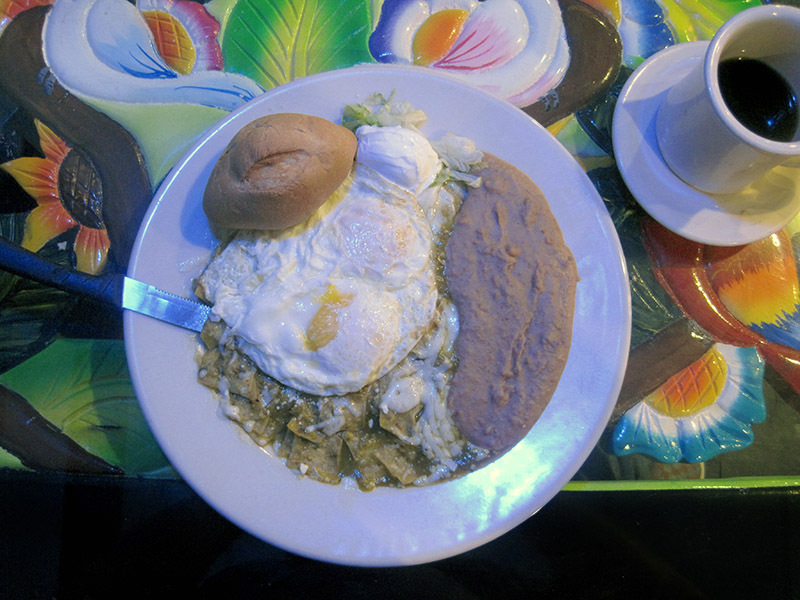 Stationed at the end of a small strip of shops, the diminutive restaurant has five (FIVE!) 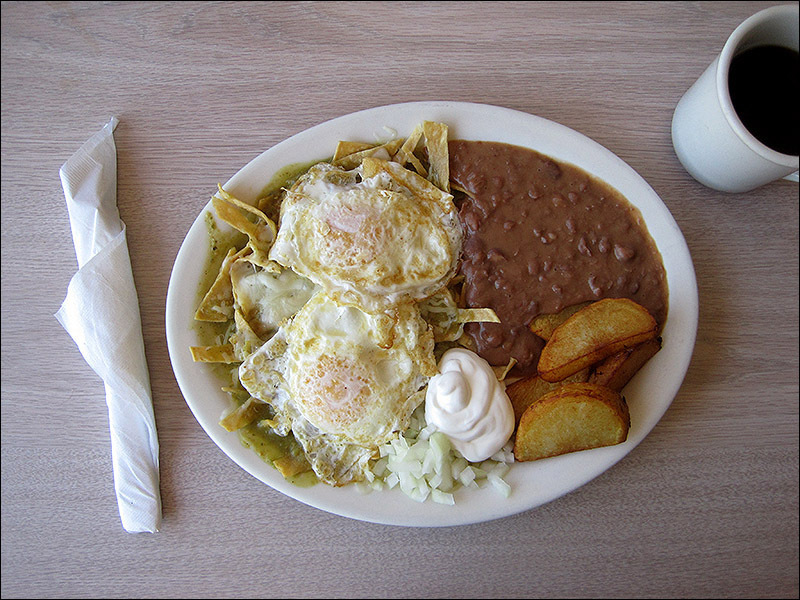 chilaquiles versions on their menu. 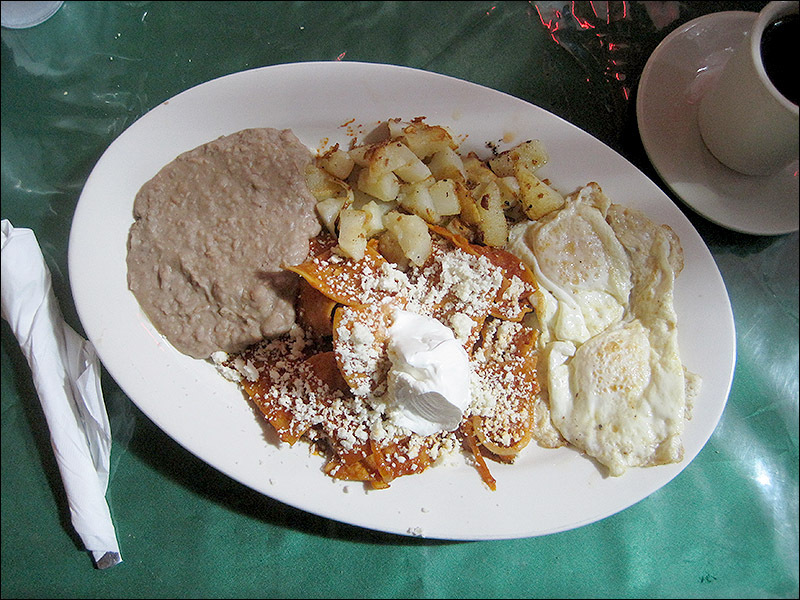 Six if you count "divorciados." 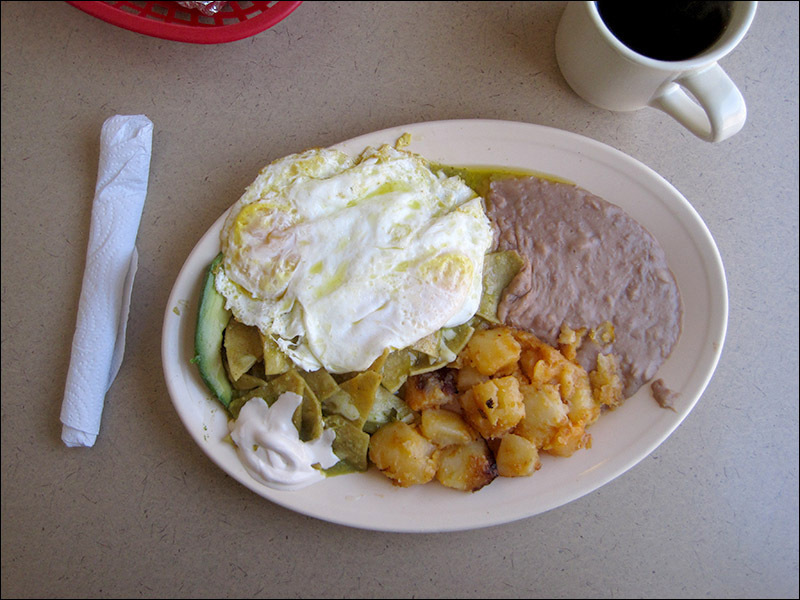 There's a tangy verdes with tomatillo and serrano, a poblano rajas version, a smoky, creamy chipotle, los potosinos with cactus, pico and molcajete ranchero, and the wonderful desvelados (levanta muertos!) 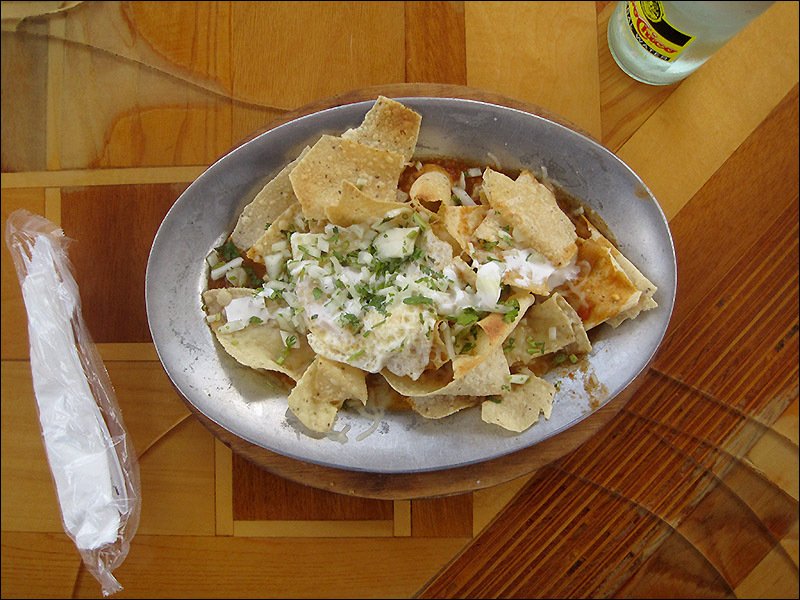 with a well-balanced (but fiery) habanero salsa. 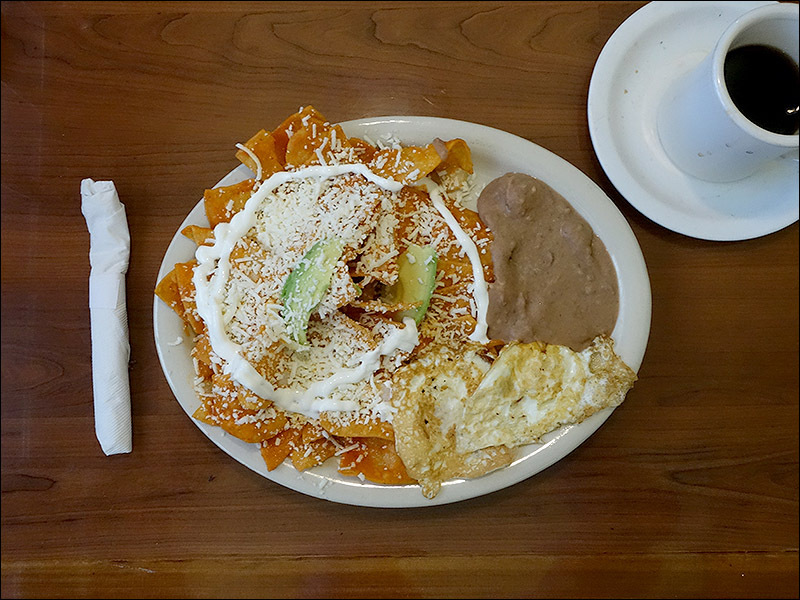 Rosita Kitchen isn't close to us in the least, and the service can be a little tepid, but I will drive the 20 miles to eat their chilaquiles. 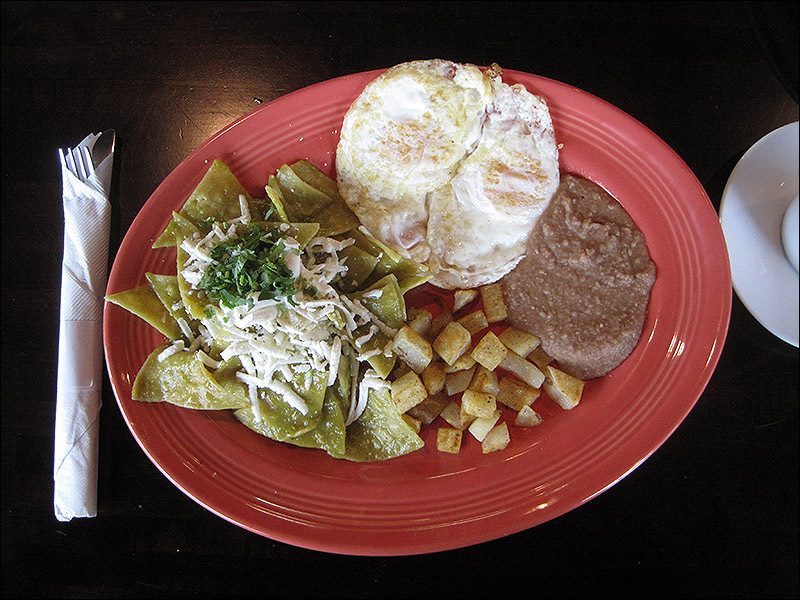 When you look at the individual components that make up chilaquiles, it doesn't look too difficult at all. 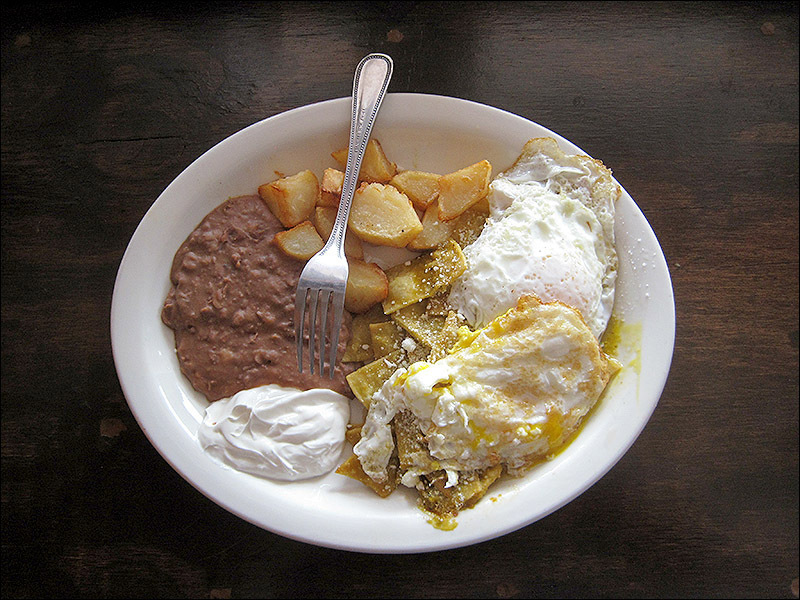 Simple, cheap ingredients in a dish that you can charge 10 bucks for at brunch. 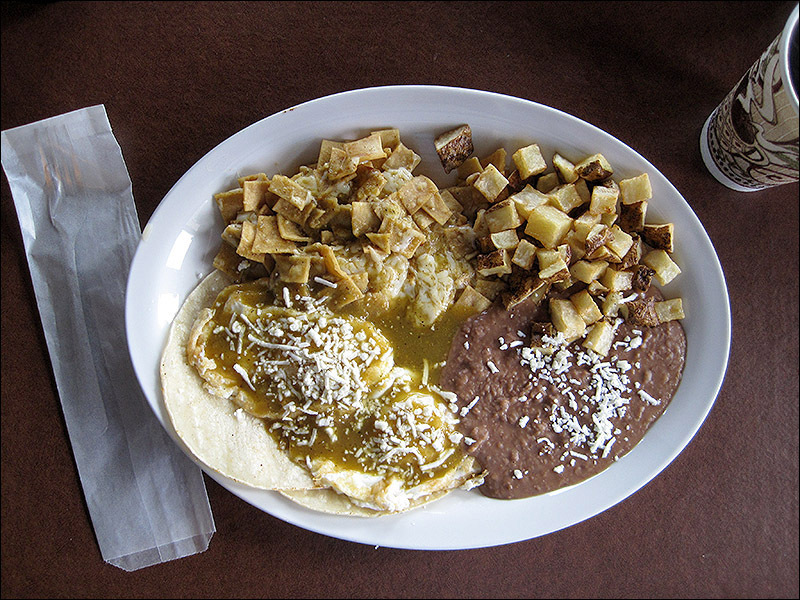 Should be a ringer, right? 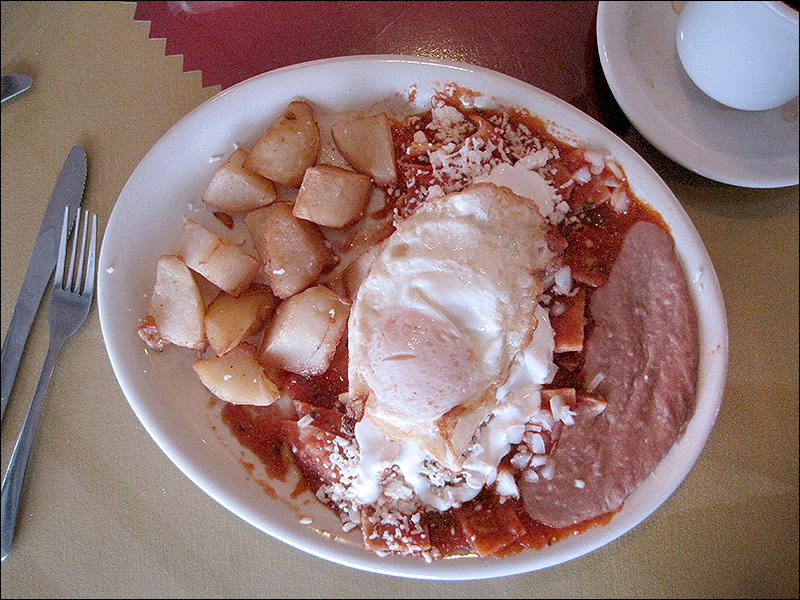 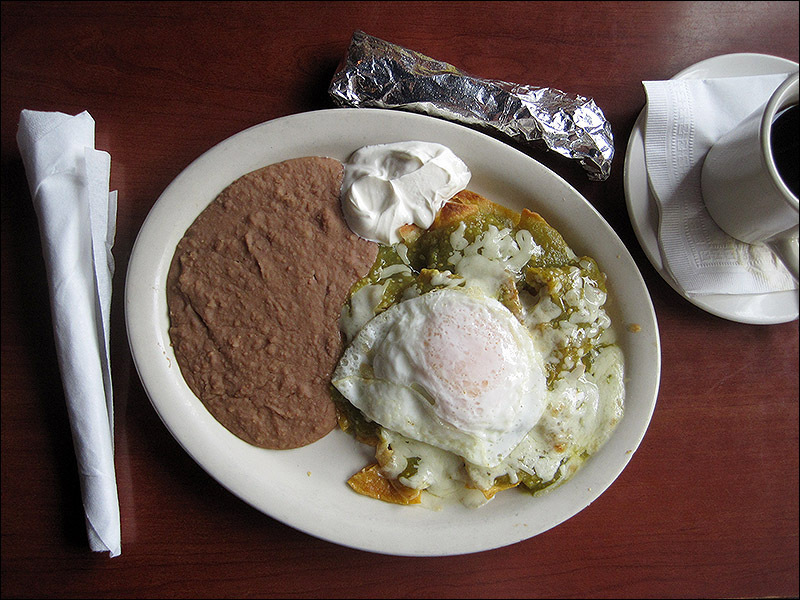 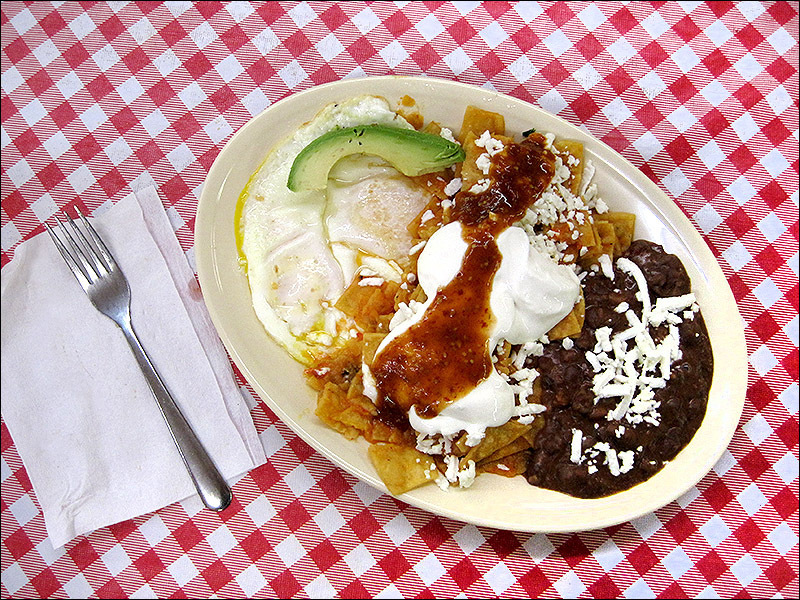 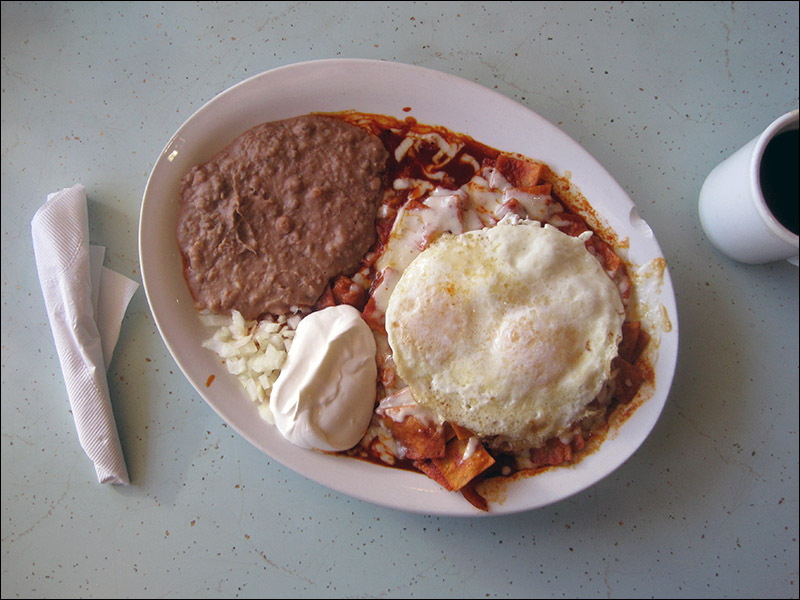 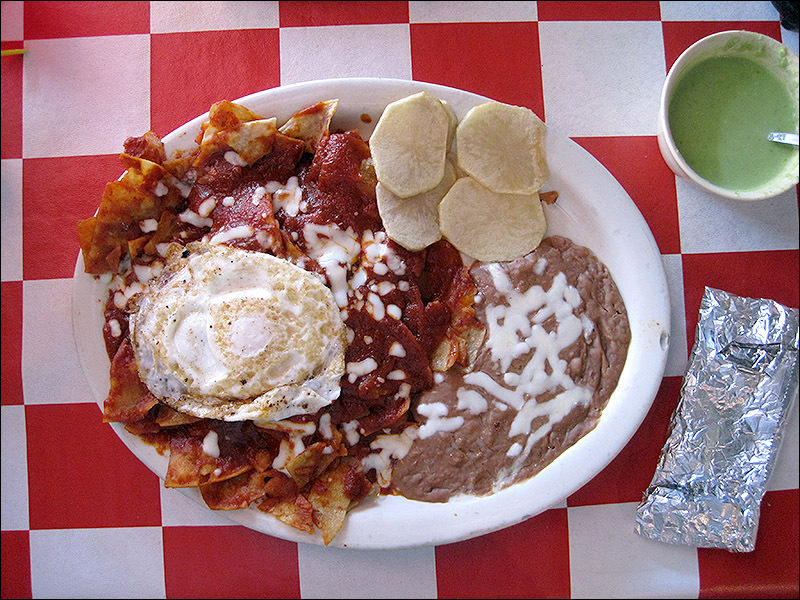 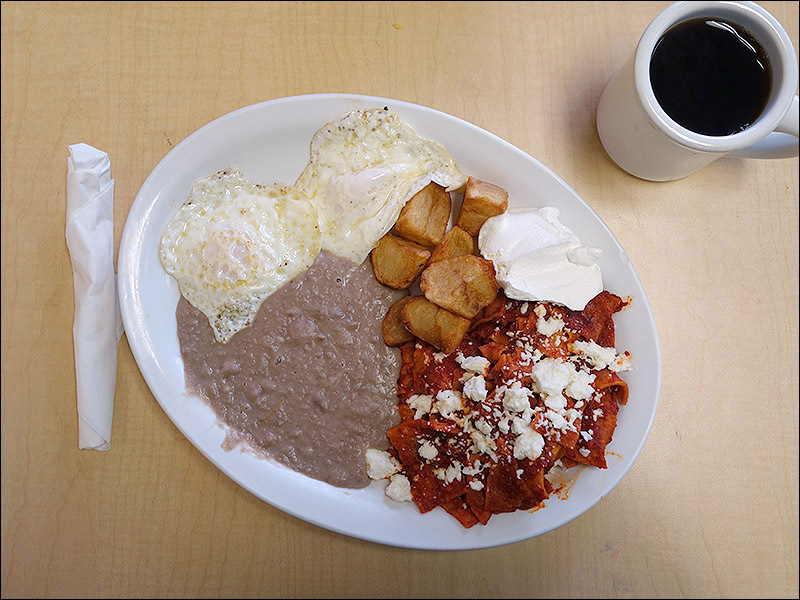 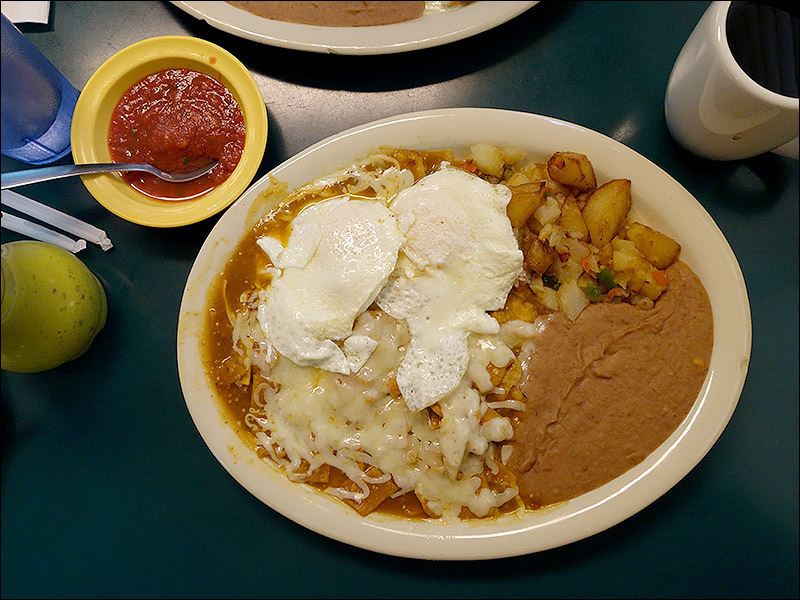 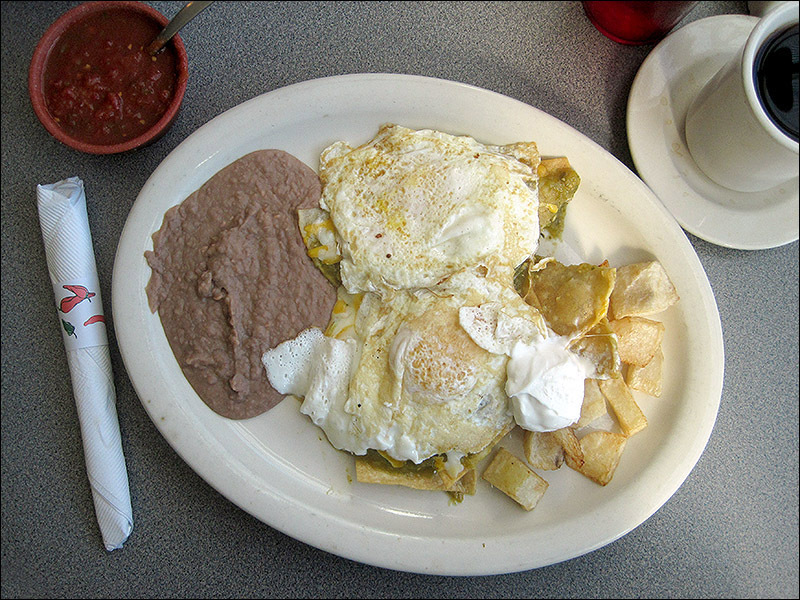 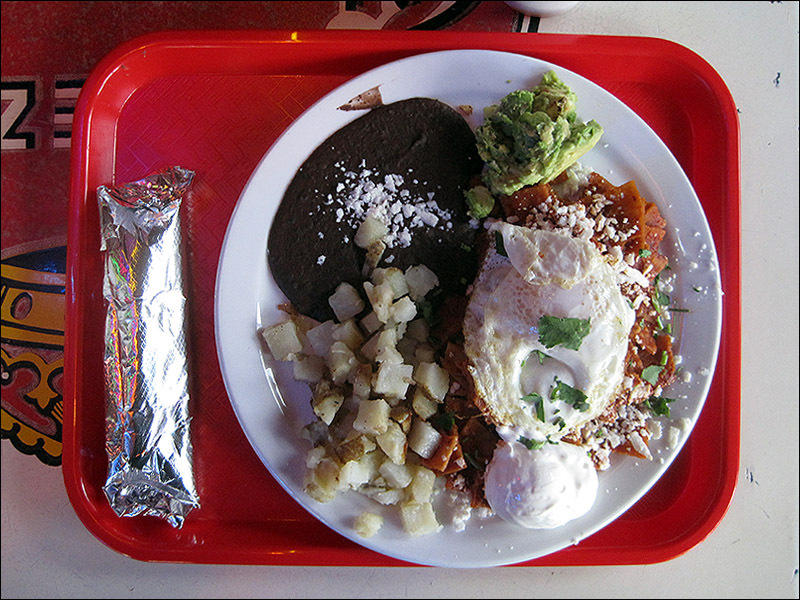 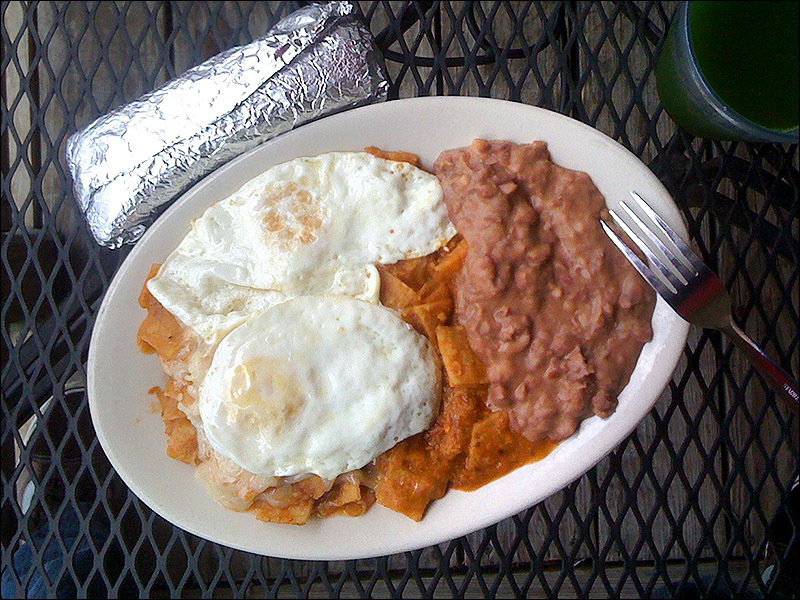 Satellite's chilaquiles are hurt by an unemotionally-bland salsa roja and sodden totopos. 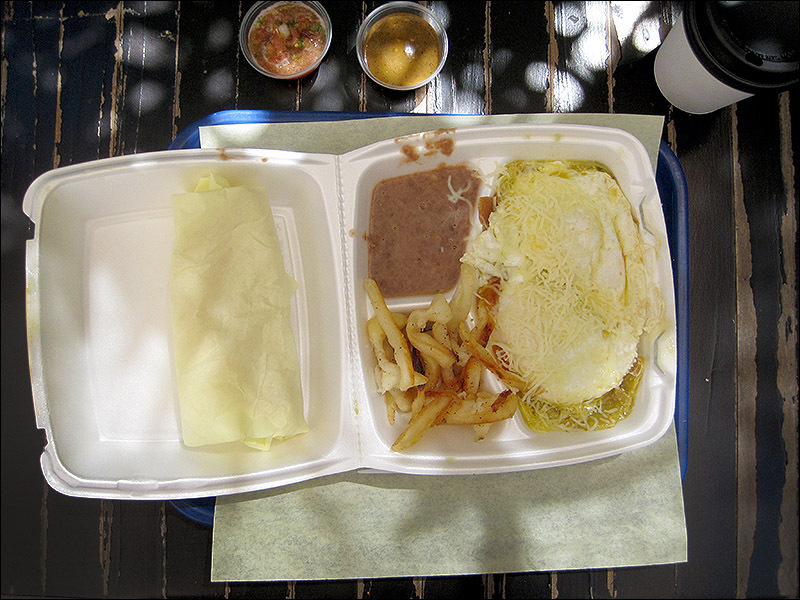 Even the side of red salsa was lacking. 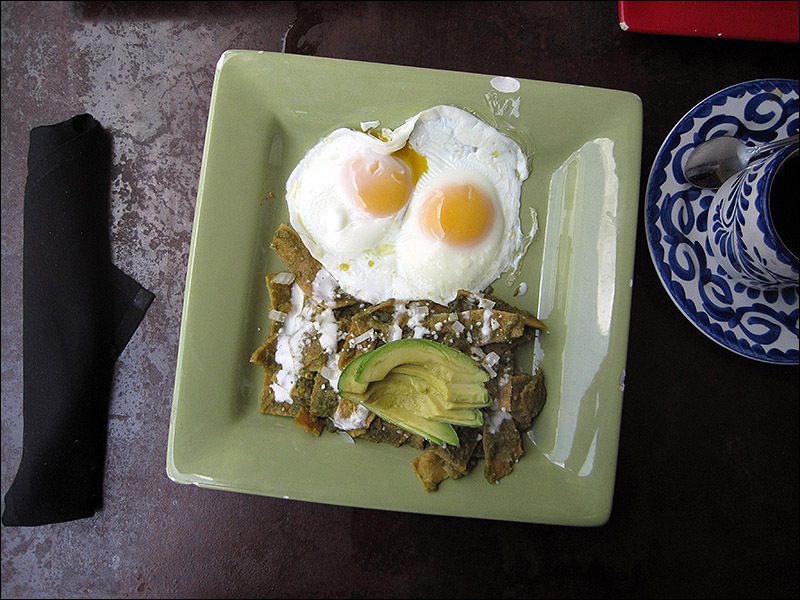 Nice avocado, nice eggs, but a blasé chilaquiles plate. 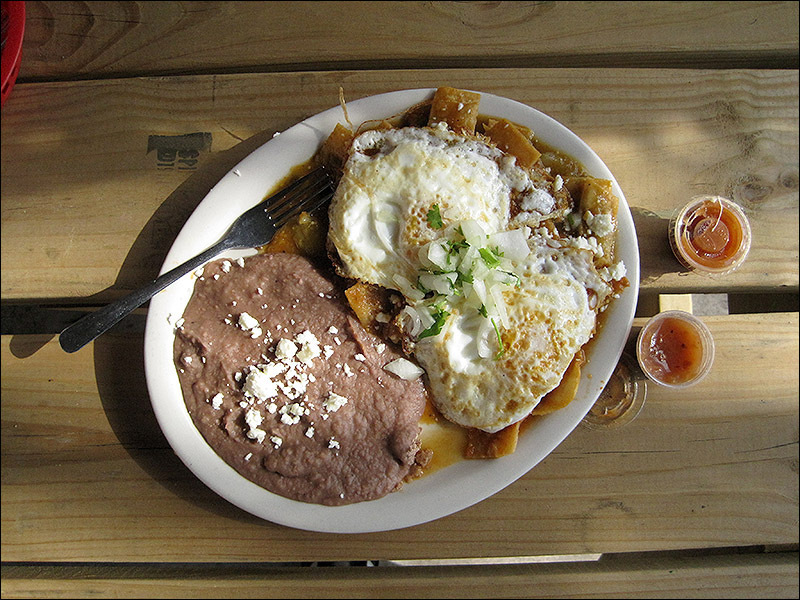 try La Montaña on Braker at I-35. 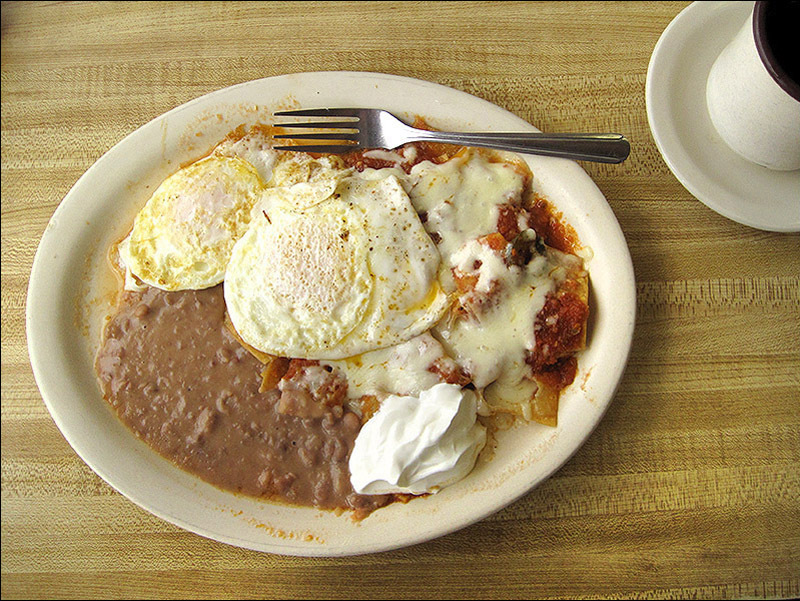 they are best in the city, IMO. Best in the city is high praise! 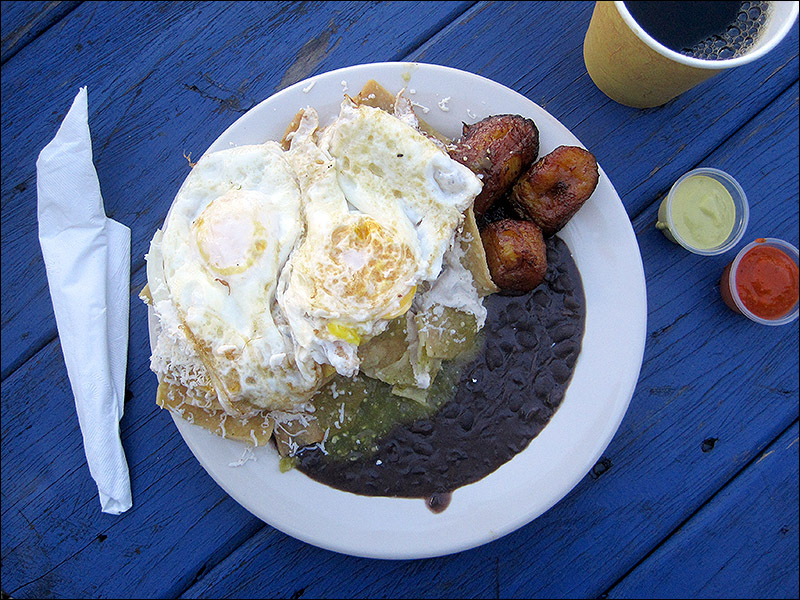 I've added La Montaña to the list. 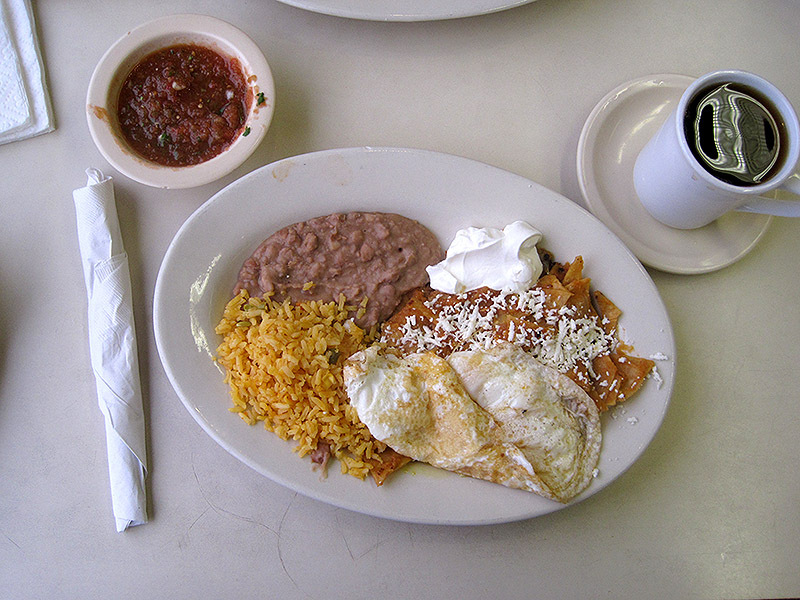 You missed my fave--Los Altos in Cherrywood. 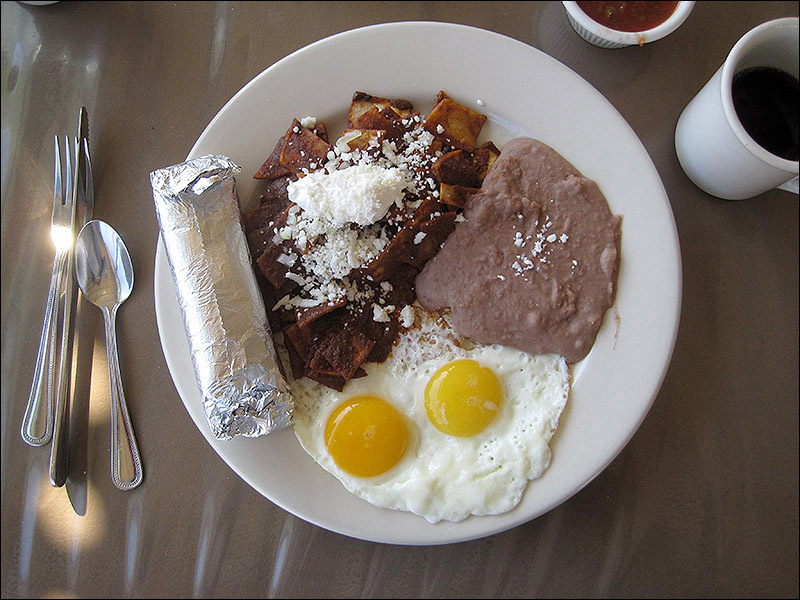 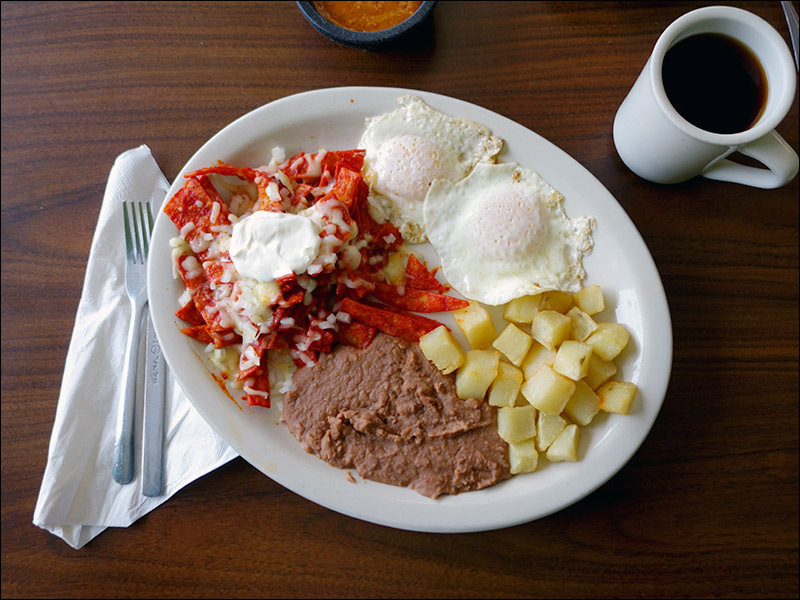 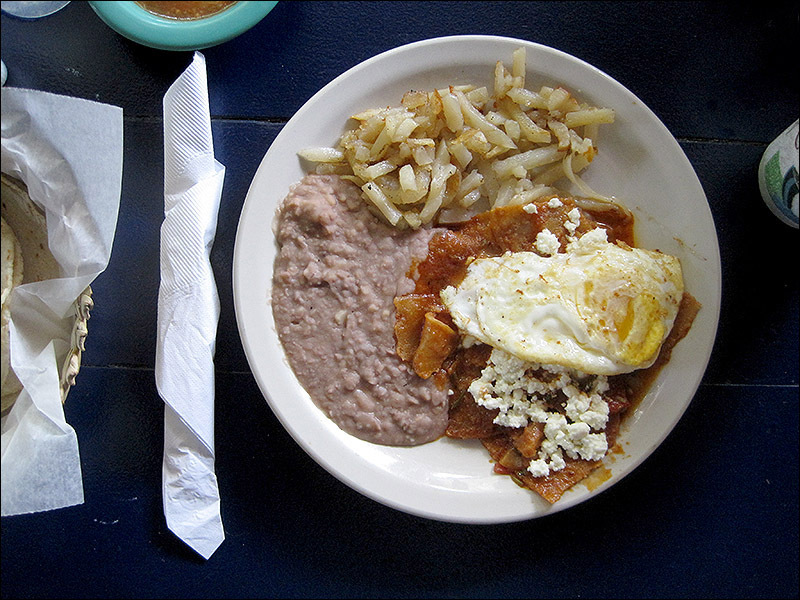 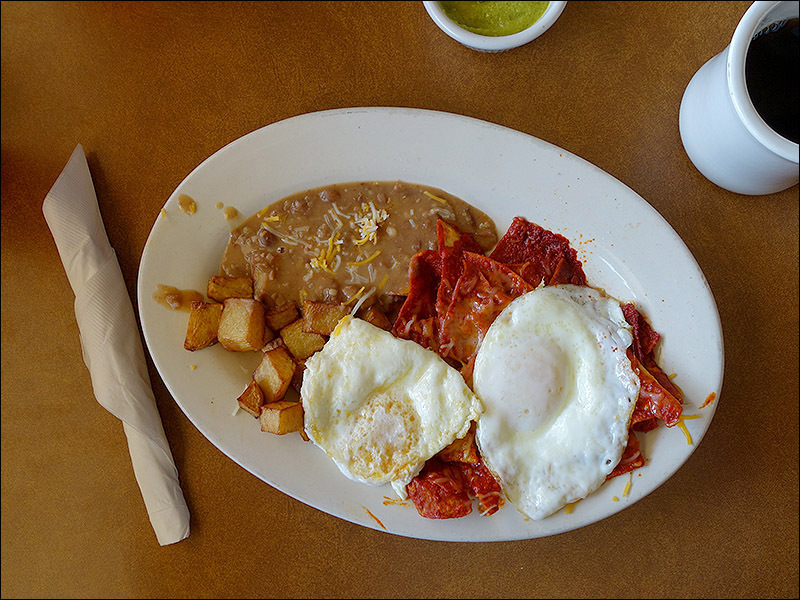 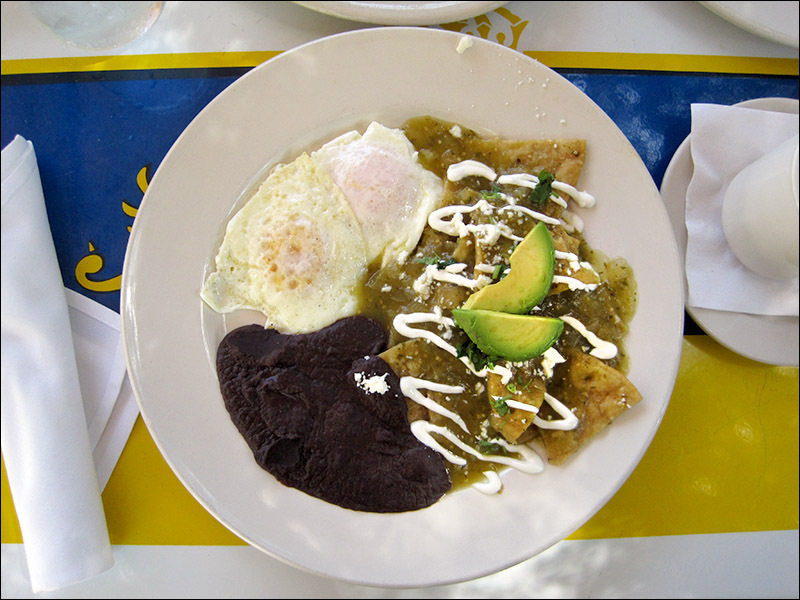 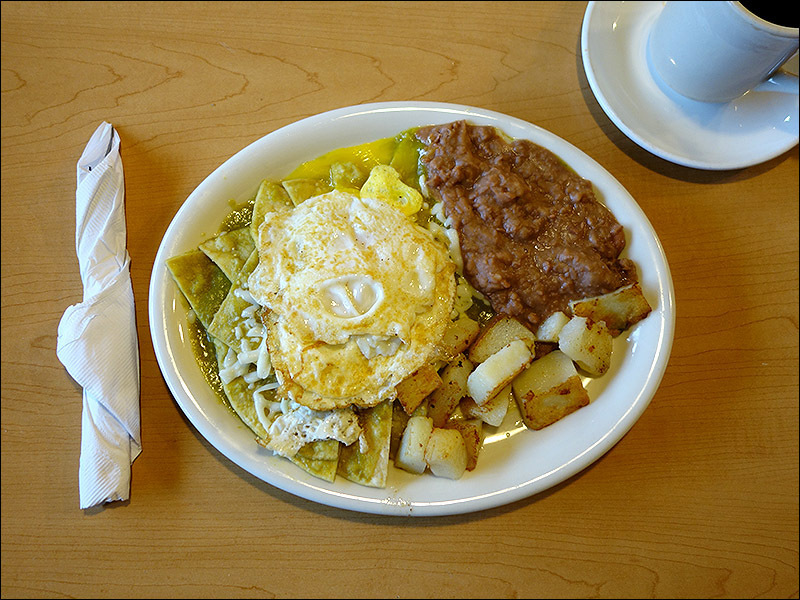 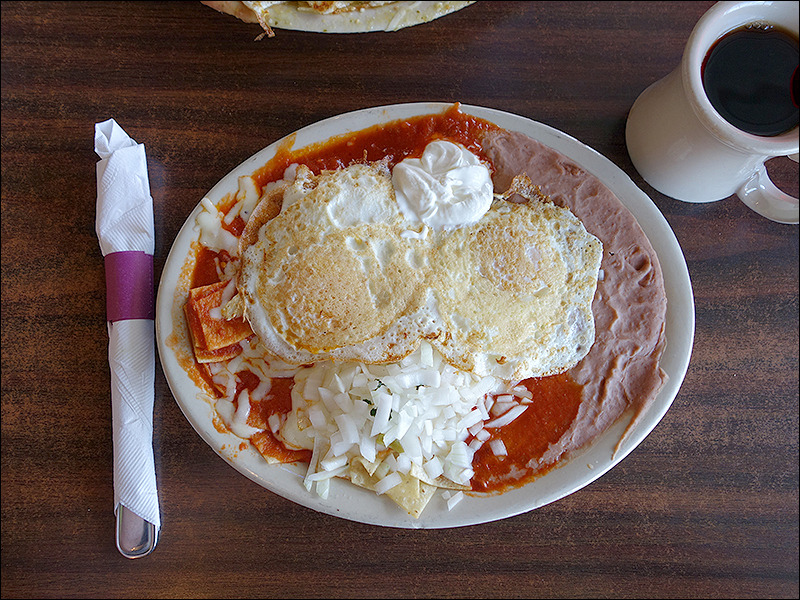 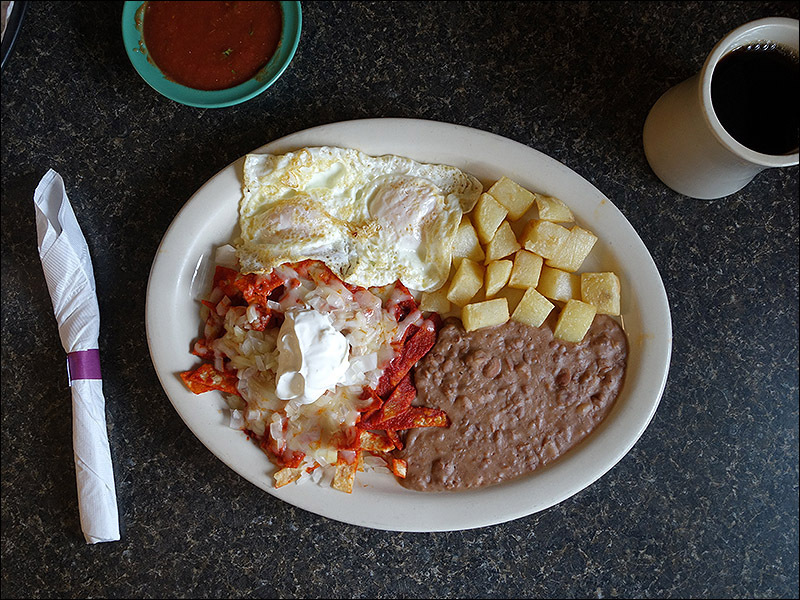 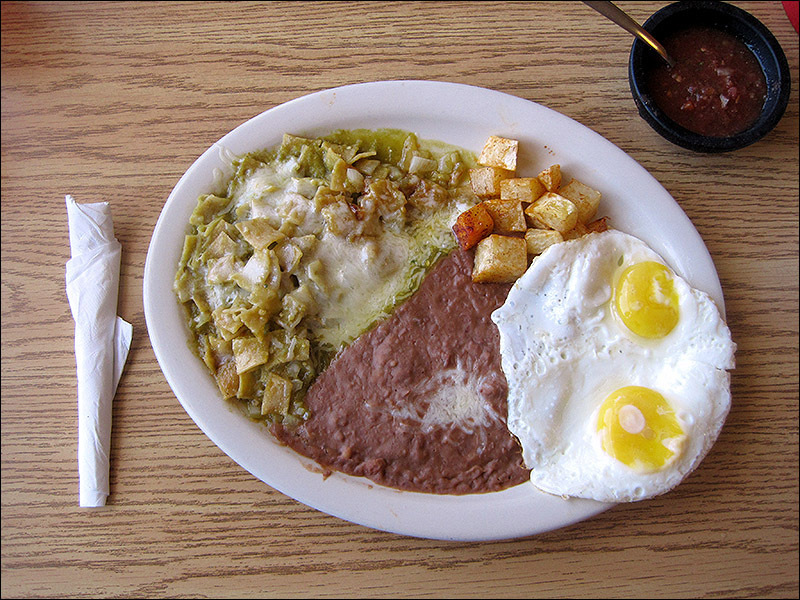 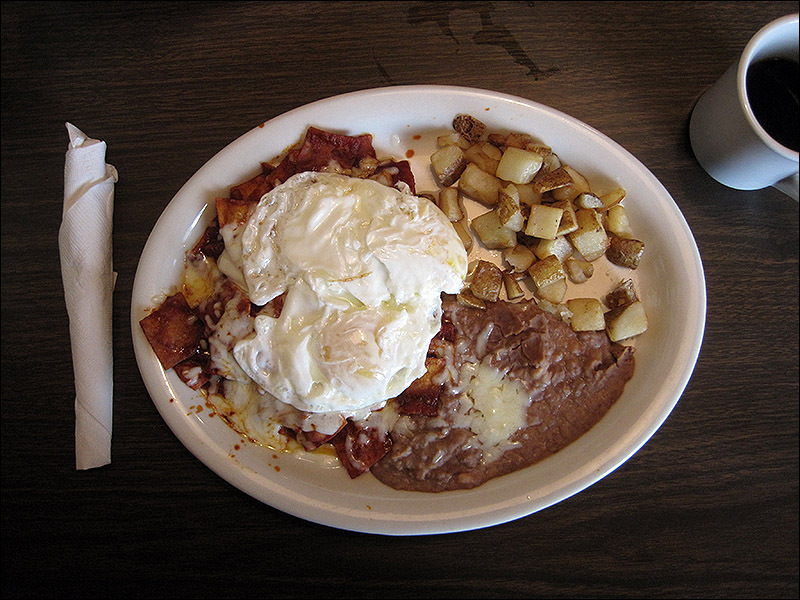 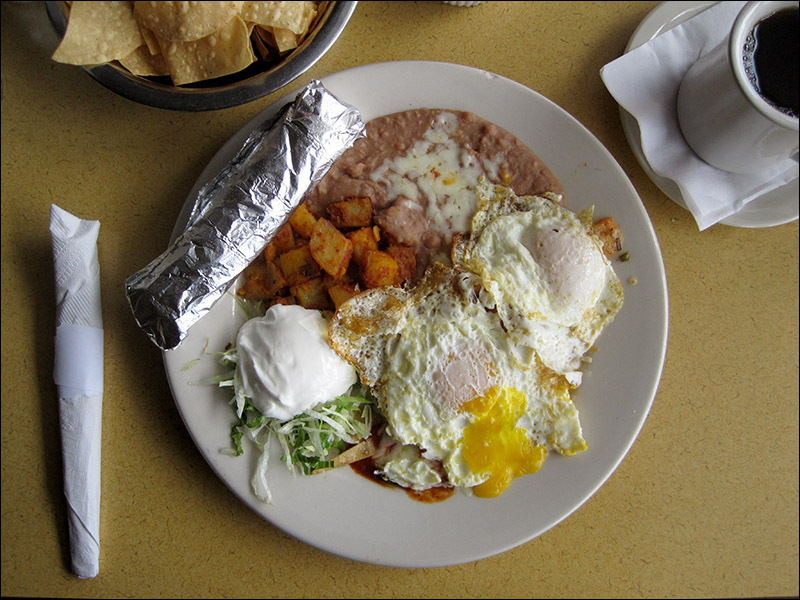 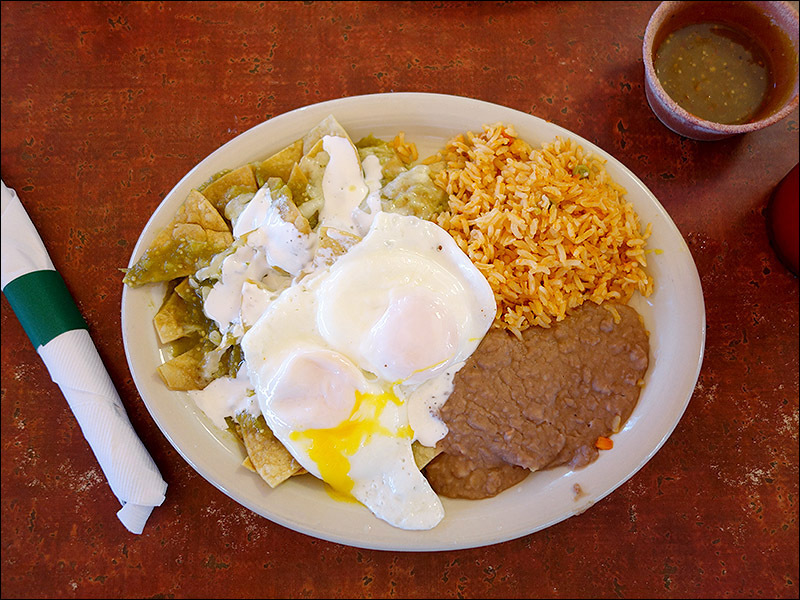 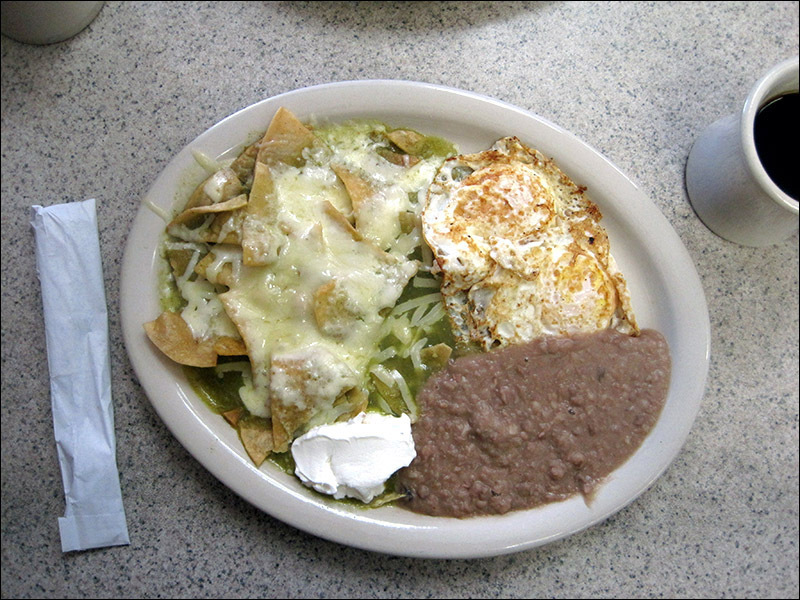 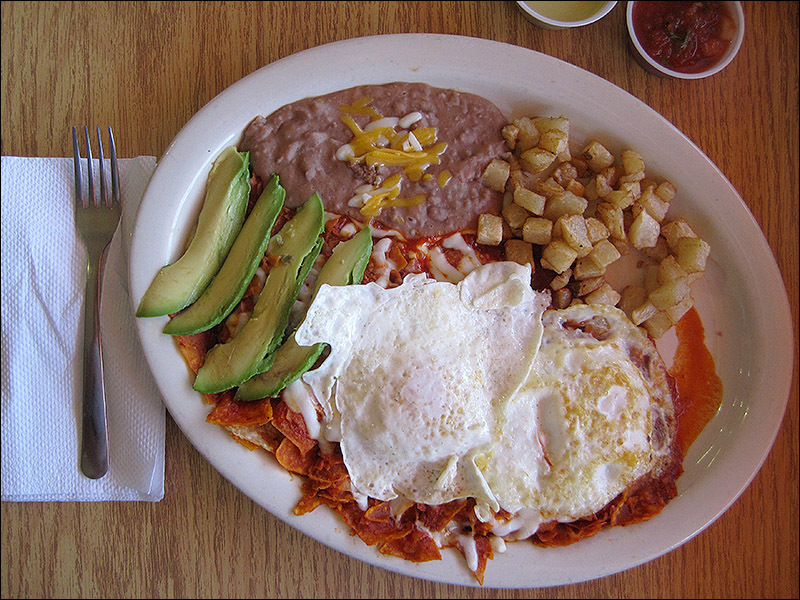 Los Altos used to not have chilaquiles on their menu. 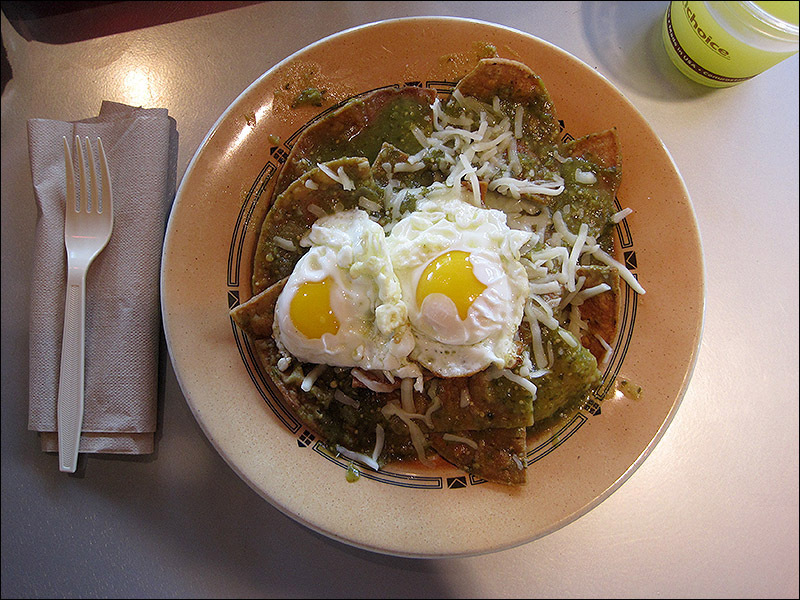 I'd called a few years ago and they said they didn't serve them, nor were there any on the Yelp photos of their menu. 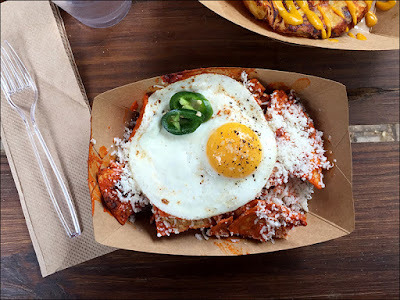 We will definitely check them out!